Notes: Secret compartment hidden inside of chocolate bar. 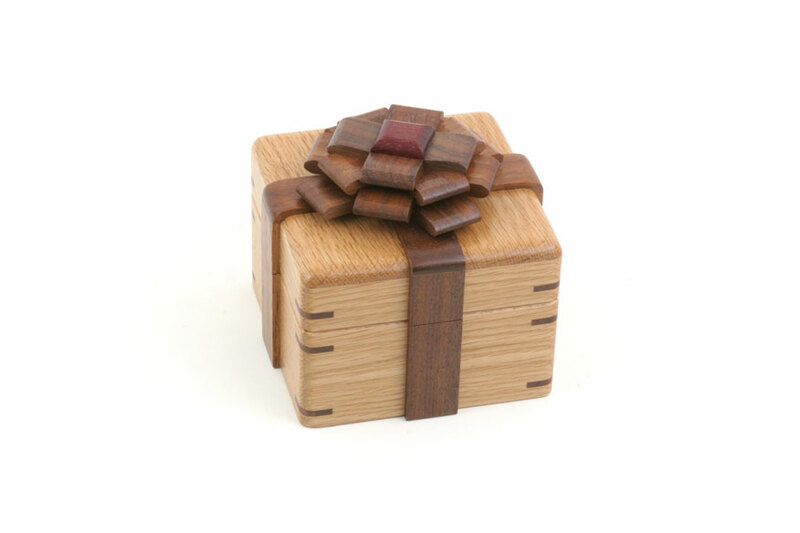 Made from rosewood, lacewood, walnut, and fabric. Notes: The final and most challenging of the Havana's cigar box series. 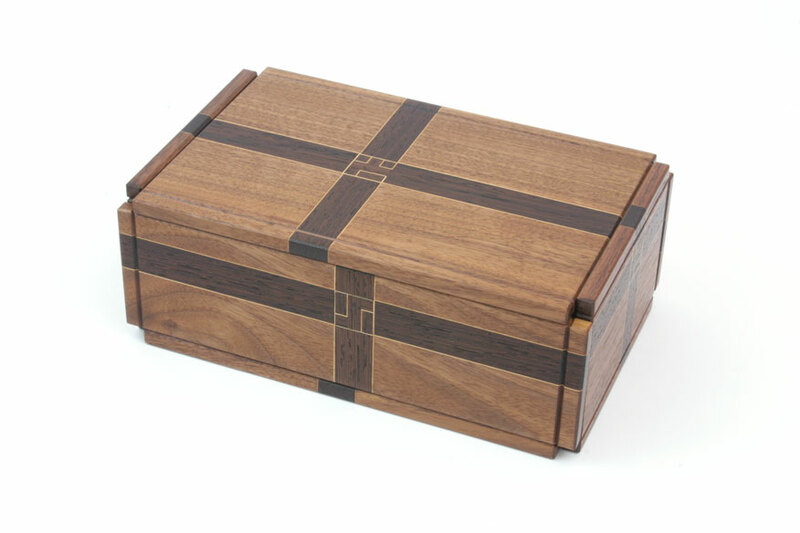 Made from quartersawn sapele and wenge veneer. Signed and dated; limited edition of 75. Notes: Open the secret compartment; mechanism is stiff. 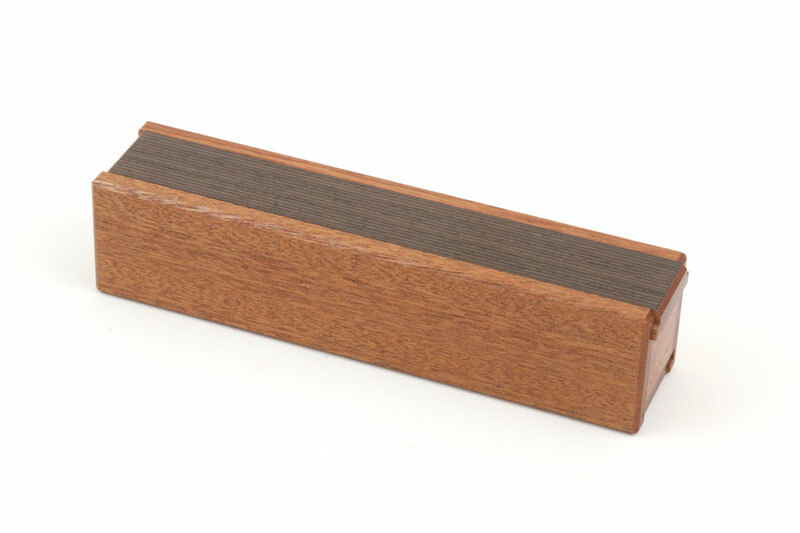 The pen holder, and dark block on left are both loose. Includes original box and solution sheet. Notes: Open the trick box. This was a 2008 Karakuri Christmas present. Includes original box and solution sheet. Notes: Open the trick box. This was a 2010 Karakuri Christmas present. Includes original box and copy of solution sheet. 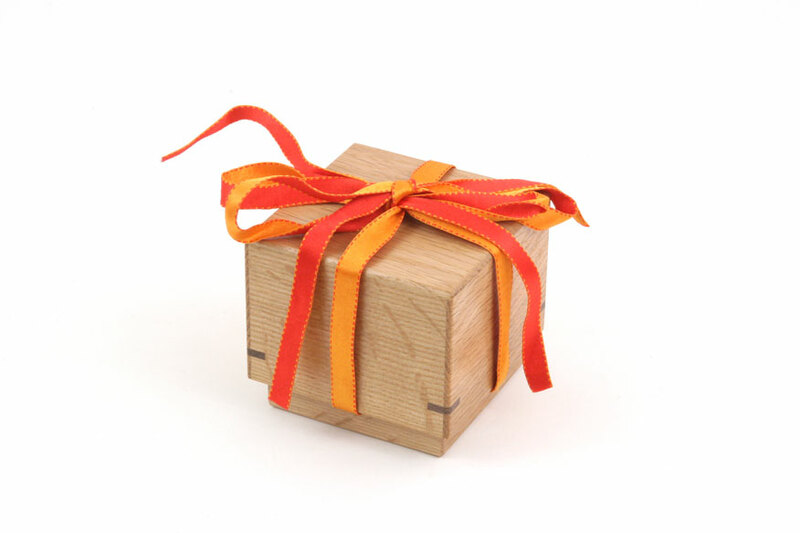 Notes: Open the trick box. Small, light scratch on top. 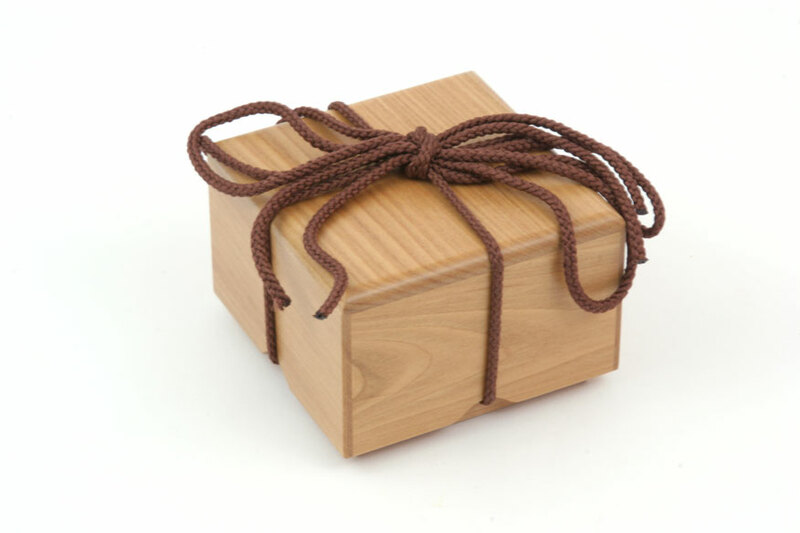 This was a 2011 Karakuri Christmas present. Includes original box and copy of solution sheet. Notes: Two sushi rolls and a knife to help you get inside them. Made of bubinga, dogwood, oak and cherry. Includes original box and solution sheet. Notes: Starts out like a typical box, but then comes a very unusual rotation move. 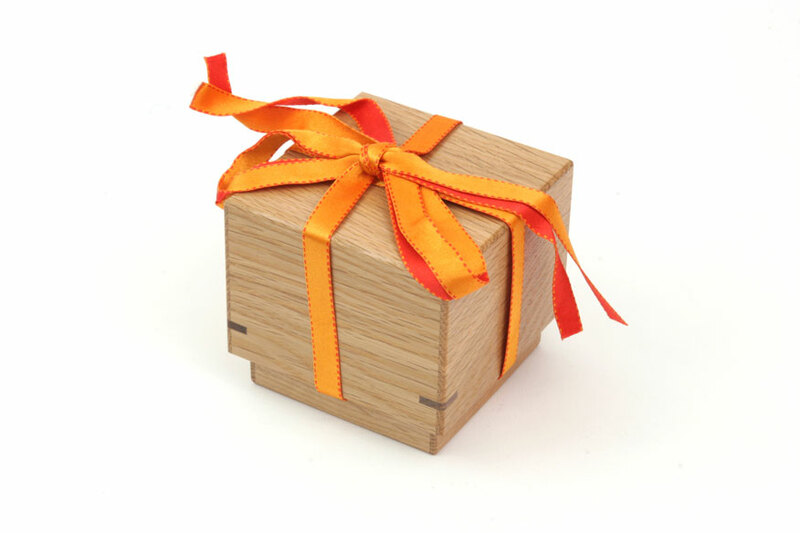 From the collaborative Creative Secret Box project of the Karakuri Group. 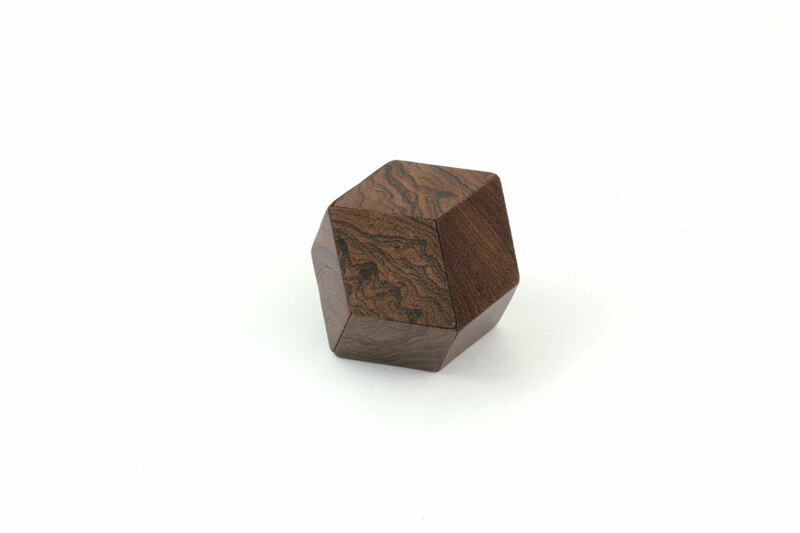 Crafted from walnut and magnolia. Very slight gaps along side panels. Includes original box and solution card. 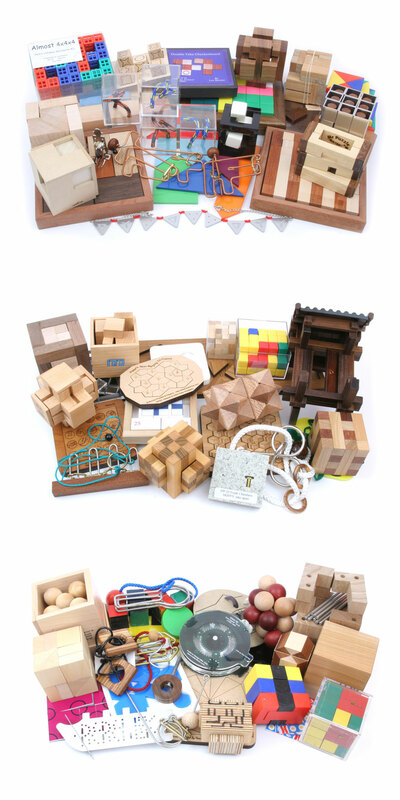 Notes: Trick box, inspired by Kamei's 3D Box (K-20). 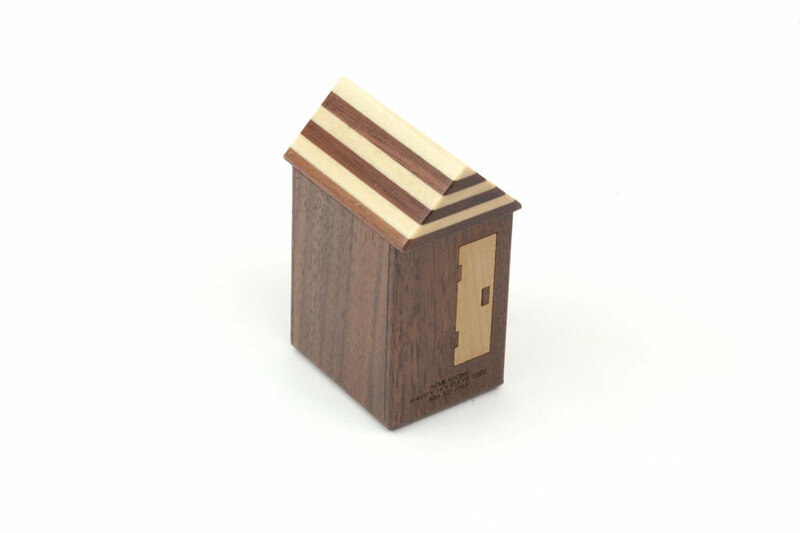 Eighth in a series of small, inexpensive boxes created through a collaborative effort of the Karakuri Creation Group. Includes original information/solution card. Notes: One in the Chotta Karakuri series of simpler designs. Includes original box and solution card. 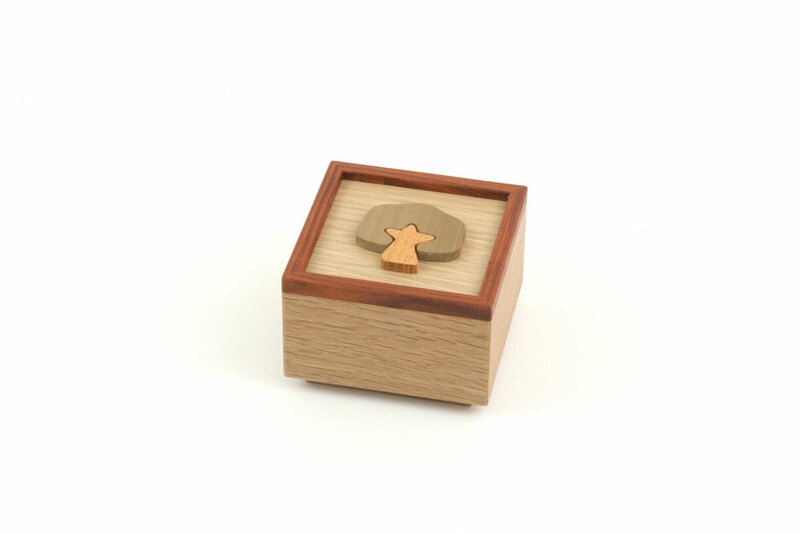 Notes: One in the Chotta Karakuri series of simpler designs; the bear is a separate magnetic piece that can stick to the outside of the box. Includes original box and solution card. Notes: Find the secret compartment. Includes original box and solution card. Notes: The unique 5-move mechanism originally appeared in the Mechanism Box '98 (IPP18 from Katagiri). 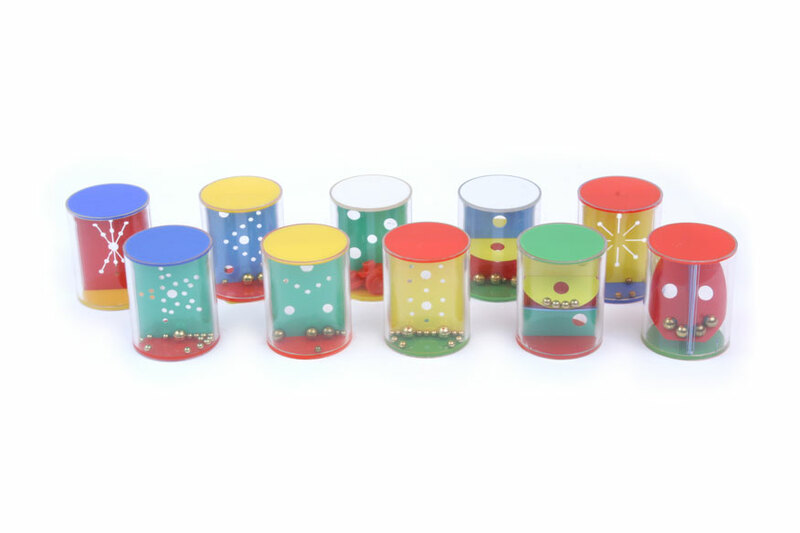 This version was made in 2003 as part of the collaborative Creative Secret Box project of the Karakuri Group. Crafted from walnut and magnolia; very slight warping of top panel. Includes original box and solution card. 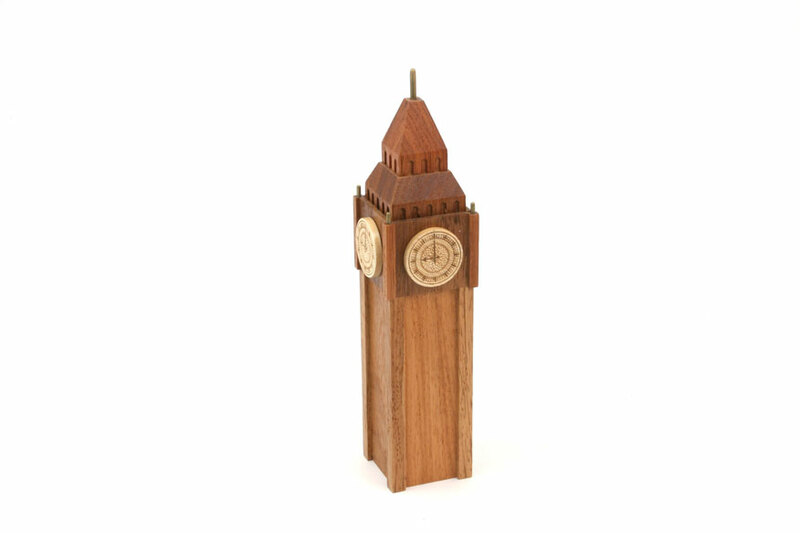 Notes: This is a very complicated and rewarding sequential discovery puzzle, with hidden tools and obstacles, leading you eventually to find "Big Ben". 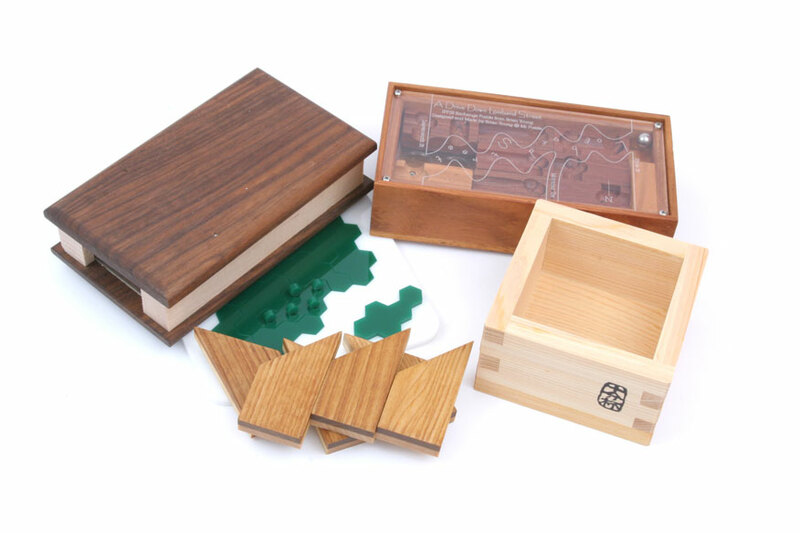 This was the jury Grand Prize at the 2015 Nob Yoshigahara Puzzle Design Competition, and was the IPP34 Exchange puzzle from John Moores. Includes original instructions/solution sheet. Notes: Put the one piece into the box. Made from cocobolo and ebony. Limited edition of 42. 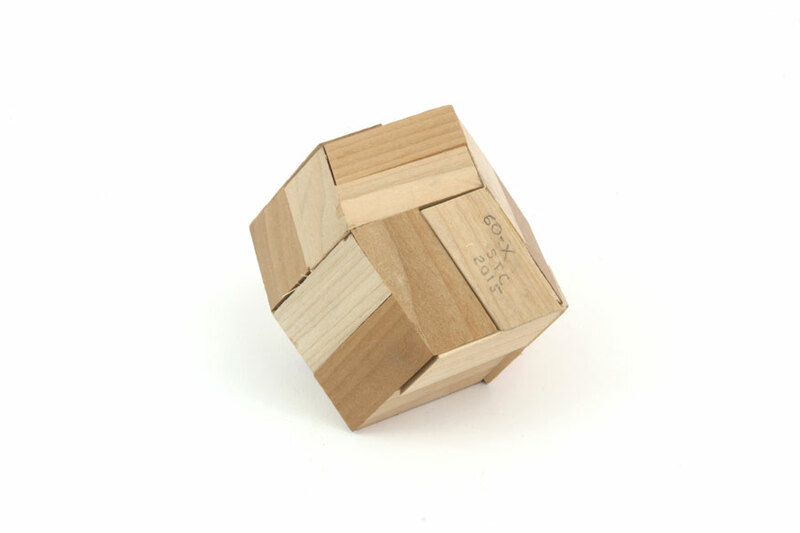 This design won the Puzzlers' Award at the 2001 Nob Yoshigahara Design Competition. 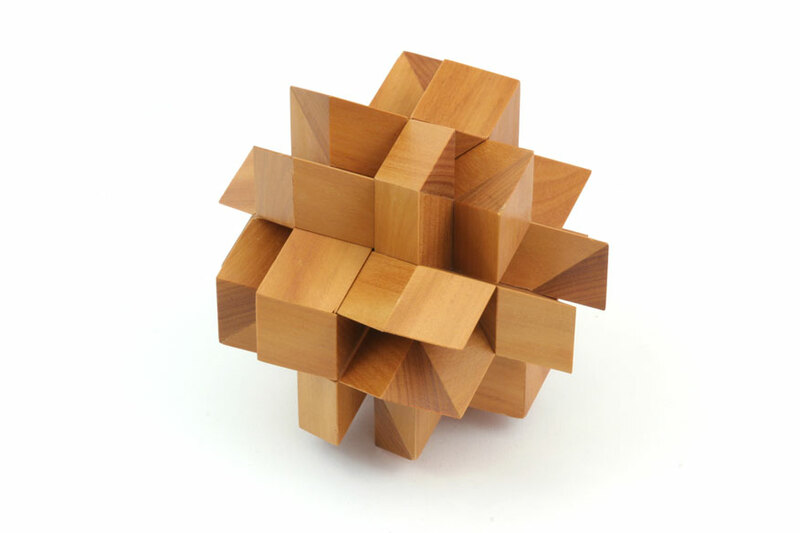 Notes: Eight pieces form a cube. One piece serves as a frame, while the complicated movement of others is constrained by numerous pins and channels. Includes detailed information and solution booklet. 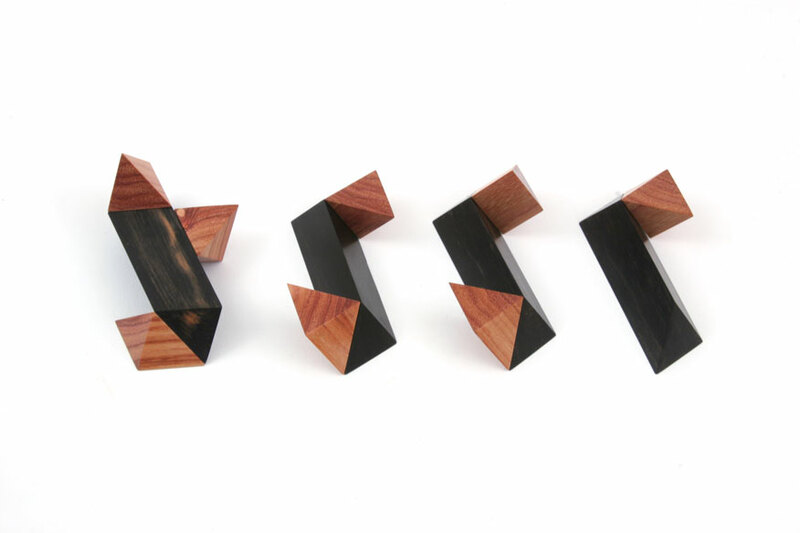 Notes: Four miscellaneous puzzles made of laser-cut custom-made 5-layer laminated plywood. 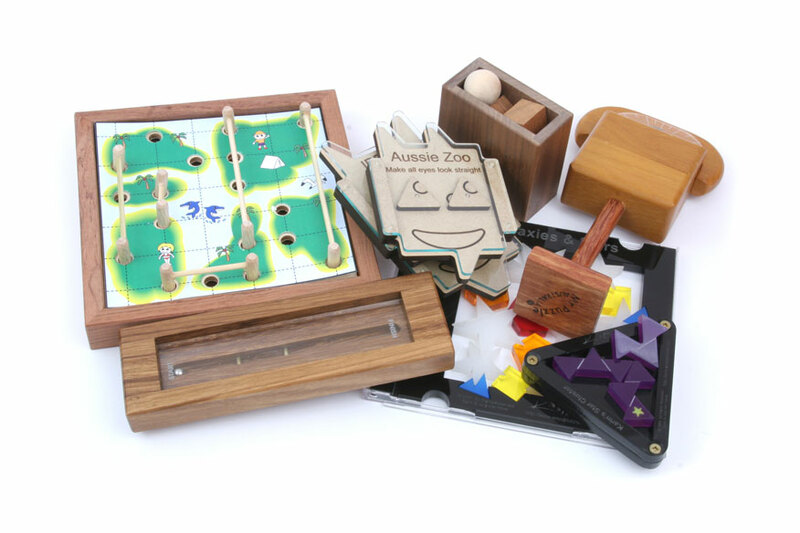 Notes: Two miscellaneous puzzles made of laser-cut custom-made 5-layer laminated plywood. 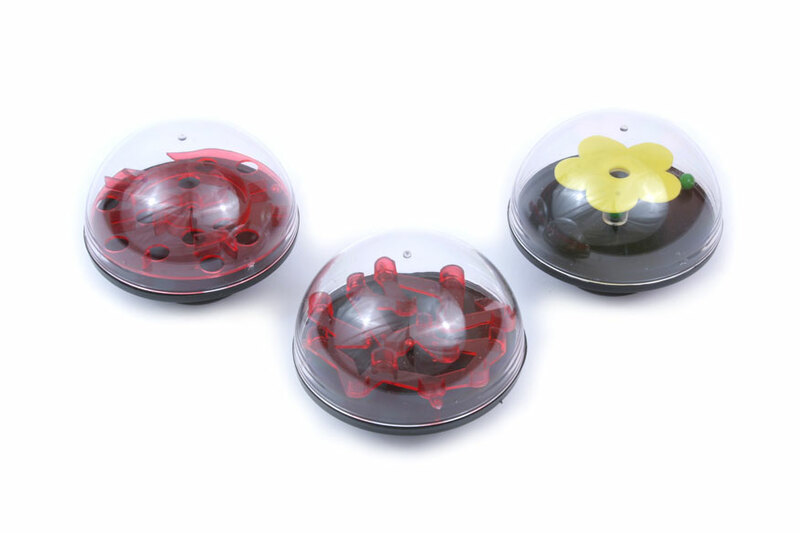 Notes: Design inspired by the Lotus Table: rotate the eight rings to, eventually, open four drawers. 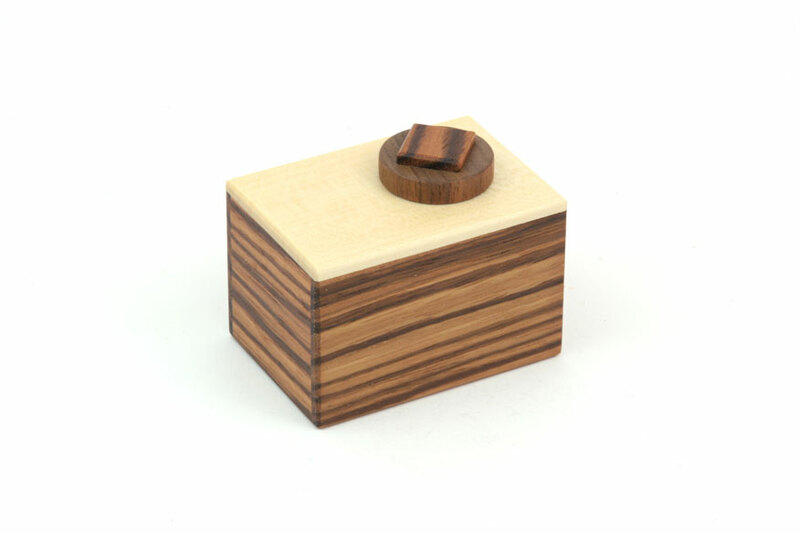 Box made from claro walnut and curly maple; the rings are made from birch, madrone, and wenge. Limited edition of 104. Includes original certificate and solution booklet. 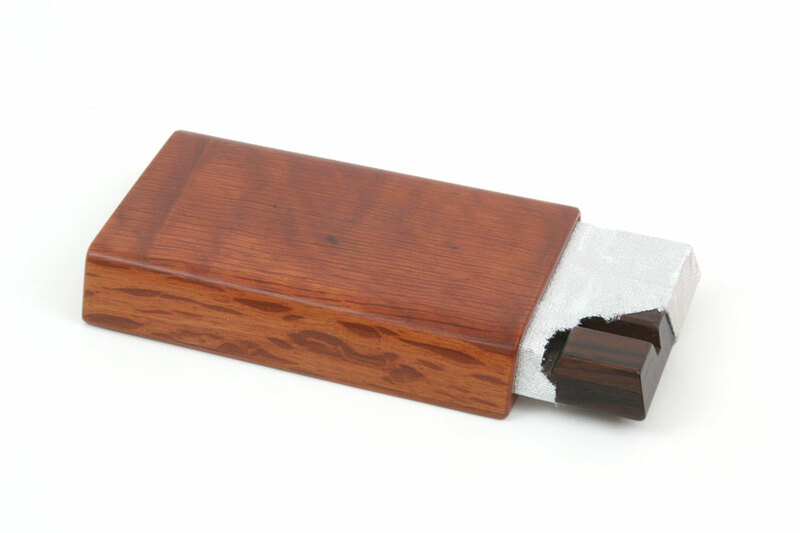 Notes: Each face has two perpendicular sliding plates (cocobolo and holly), interacting with each other and also with the plates on adjacent faces. The goal is to remove the key plate to reach the inside of the frame. (ebony). 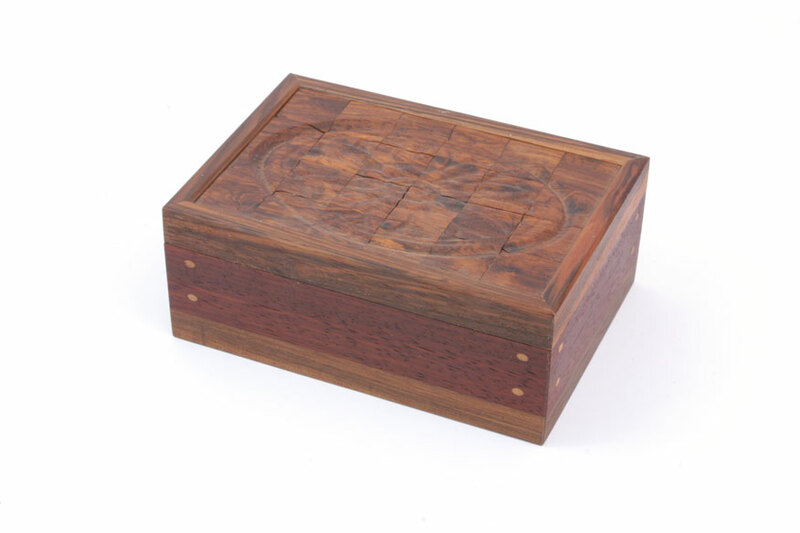 The frame does not disassemble as is the case with the standard Maze Burr; rather the extra six cocobolo maze plates are stored between the holly plates and the frame. Limited edition of 60; excellent condition and movement. Includes original certificate and information booklet, which includes 27 challenges and solutions ranging from six to 115 moves. The puzzle is currently configured for problem #22, to be solved in 94 moves. 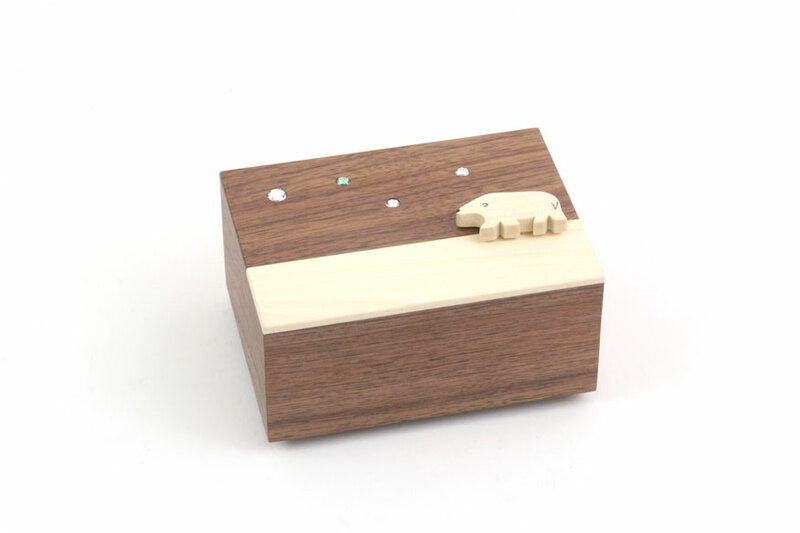 Notes: This is the fifth and final member of the Waterfall Box series. 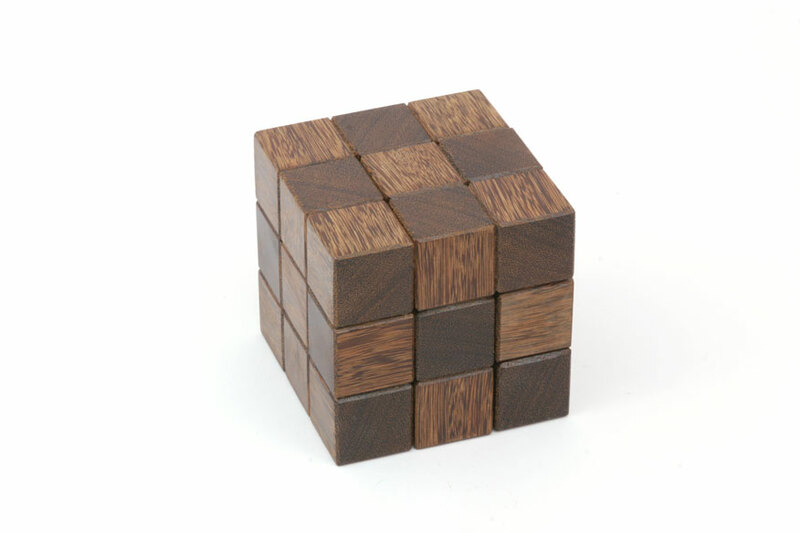 The 83 moves to open the boxes are clued by the wenge patterns, showing both the possible movement of each panel and the final alignment. 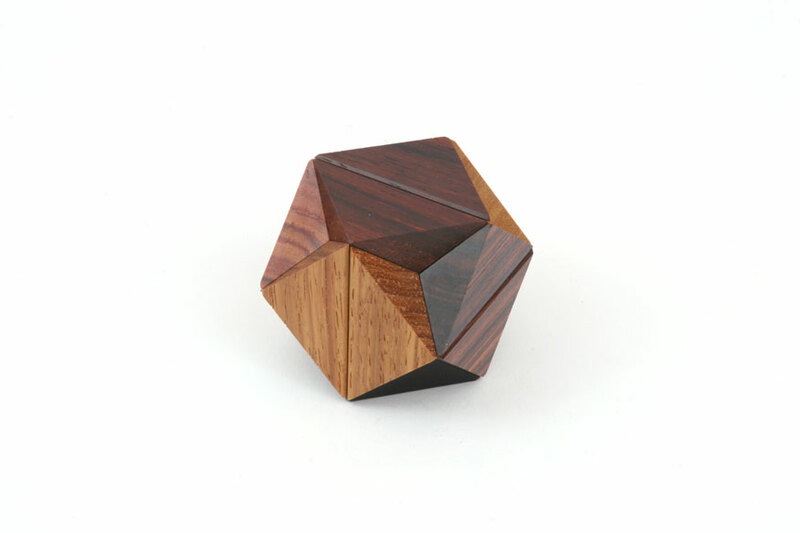 Crafted in walnut, wenge and maple. Includes original certificate, and detailed solution booklet. Limited edition, #26 of 50. 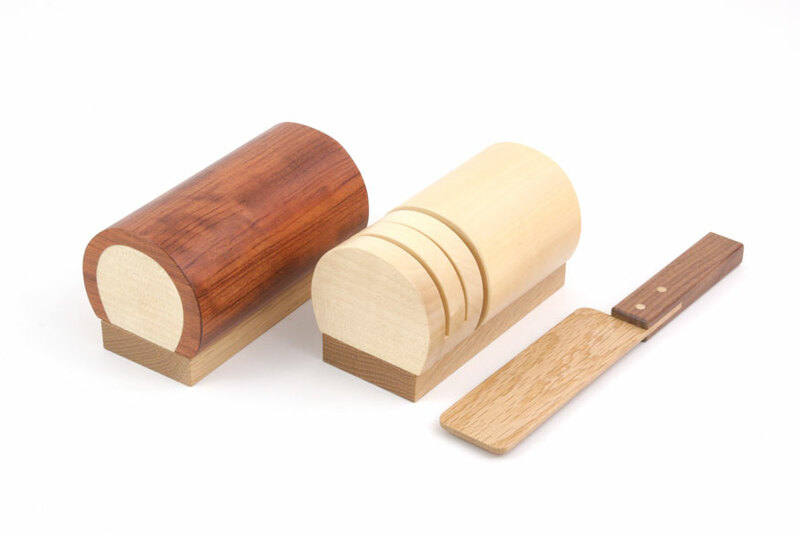 Notes: Box has one large compartment for storing and sharpening pencils, and one secret compartment to be unlocked. 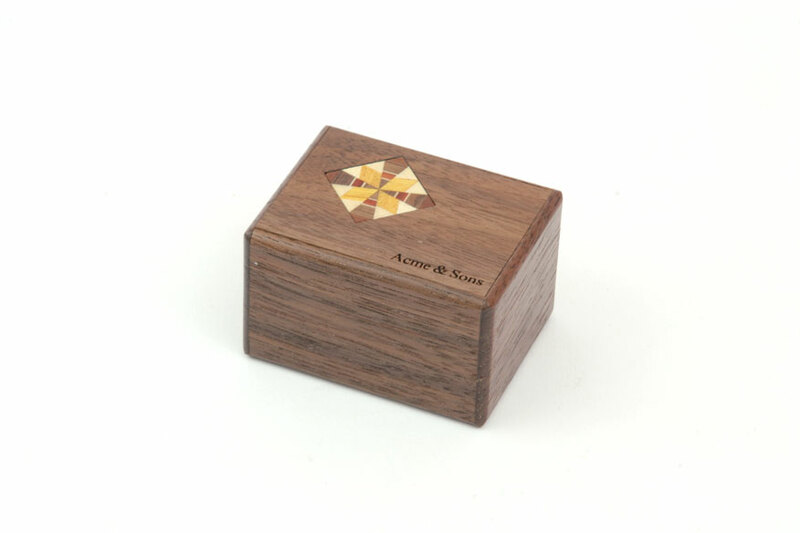 Made from walnut, curly maple, wenge, poplar, gabon ebony, and lignum vitae. Limited edition of 80. Includes original certificate and information sheet. 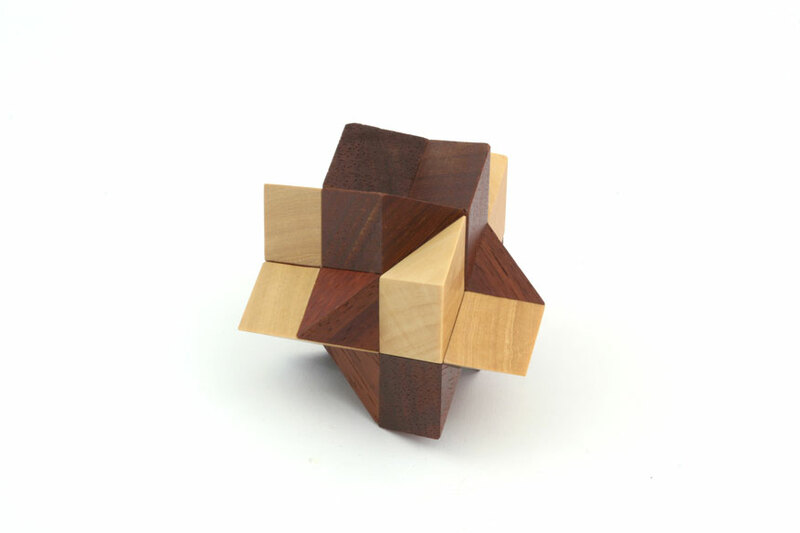 Notes: A dexterity puzzle to remove the horizontal and vertical blocks. 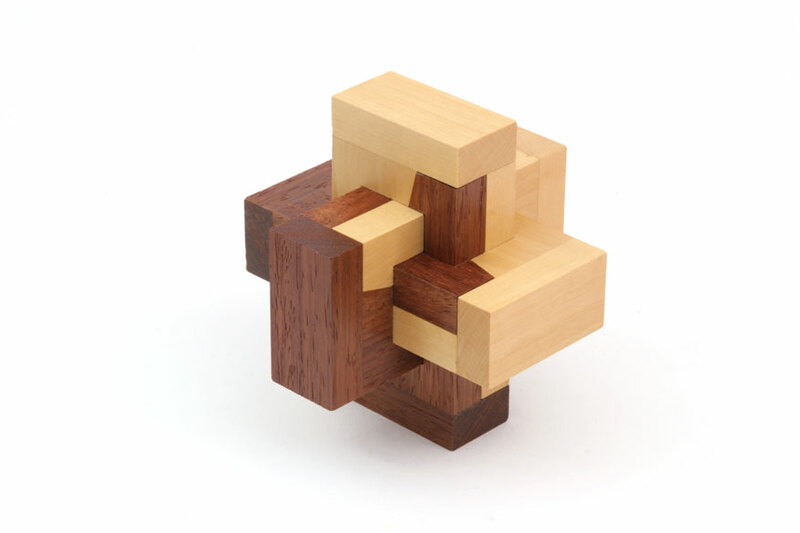 A similar puzzle (Box B) was the IPP17 Exchange puzzle from Yoshi Kotani. Notes: 14-move traditional box. Walnut panels with glossy finish; very slight separtion of some seams, with one very slight ding on one end. 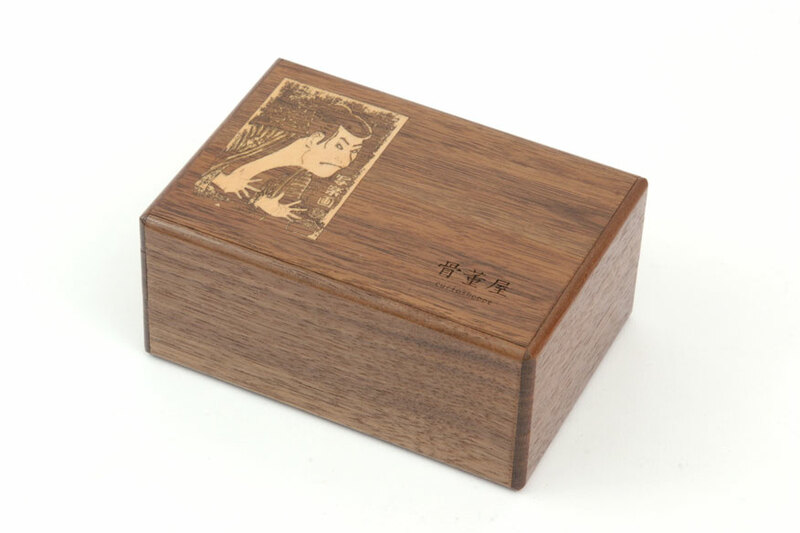 Top panel laser etched with Japanese characters and "curioshoppe". Includes original box and solution card. 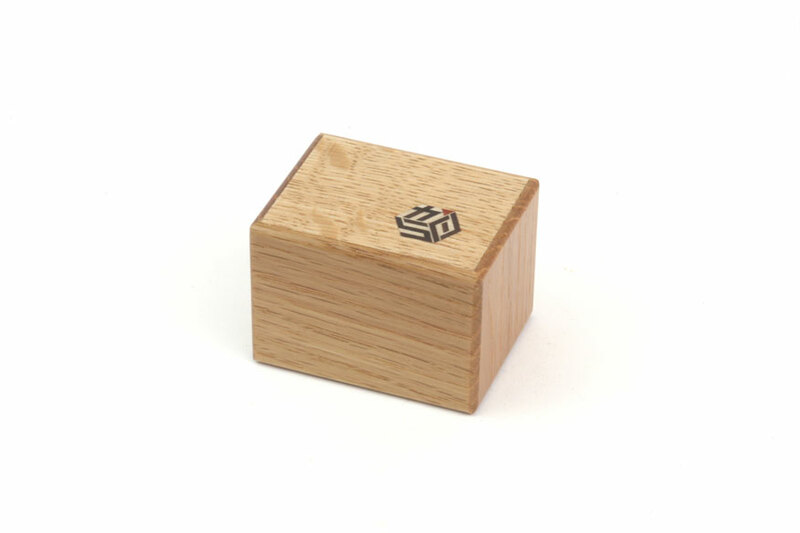 Notes: 9-move trick box, commissioned as a gift puzzle. Front is laser etched "ACME&SONS, HAPPY HOLIDAYS 2002, 800-322-2263". Notes: 10-move traditional box. Walnut panels with glossy finish; slight warp of two long side panels. Top panel laser etched "Acme & Sons"; bottom panel etched "HAKONE, IZUMIYA, made in japan". Includes original box and solution card. Notes: Unusual 3-move mechanism. 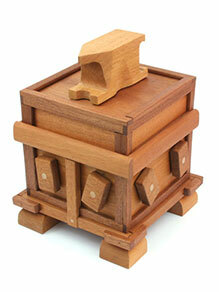 First in a series of small, inexpensive boxes created through a collaborative effort of the Karakuri Creation Group. Includes original information and solution card. Notes: Unusual 3-move mechanism, with custom yosegi pattern. 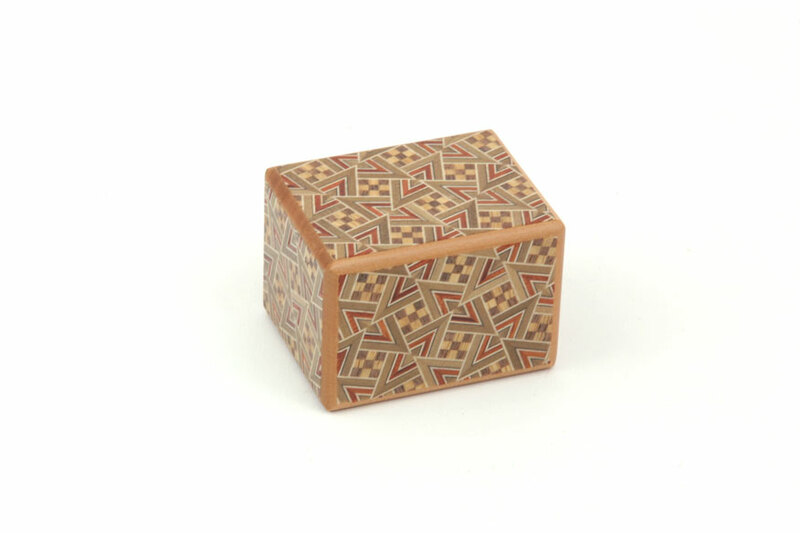 Second in a series of small, inexpensive boxes created through a collaborative effort of the Karakuri Creation Group. Includes original information/solution card. Notes: Unusual 3-move mechanism. 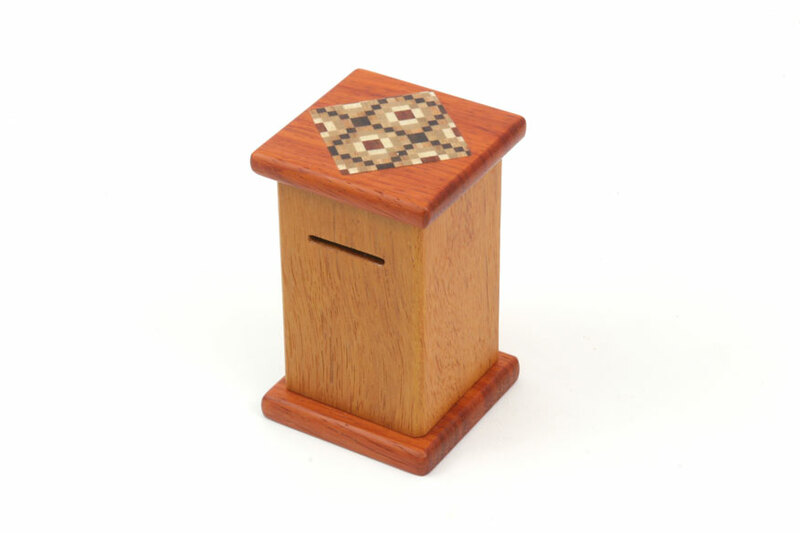 Second in a series of small, inexpensive boxes created through a collaborative effort of the Karakuri Creation Group. Includes original information/solution card. 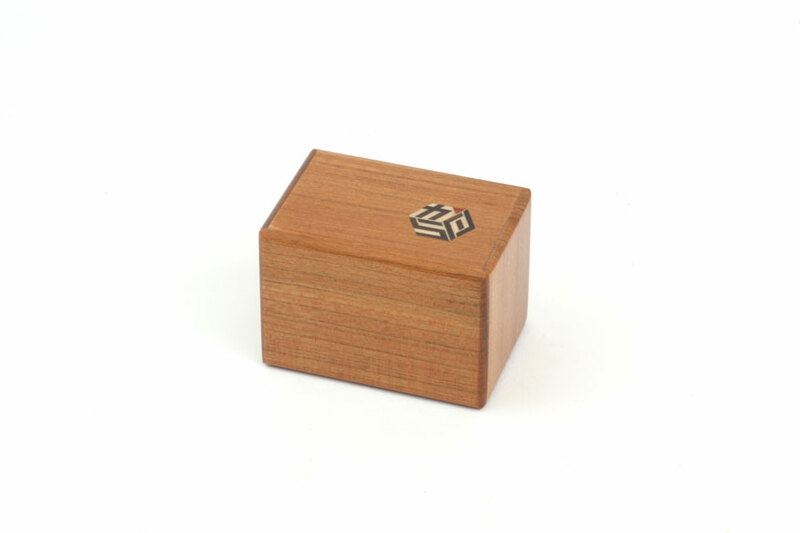 Notes: 4-move trick box, with custom yosegi pattern. 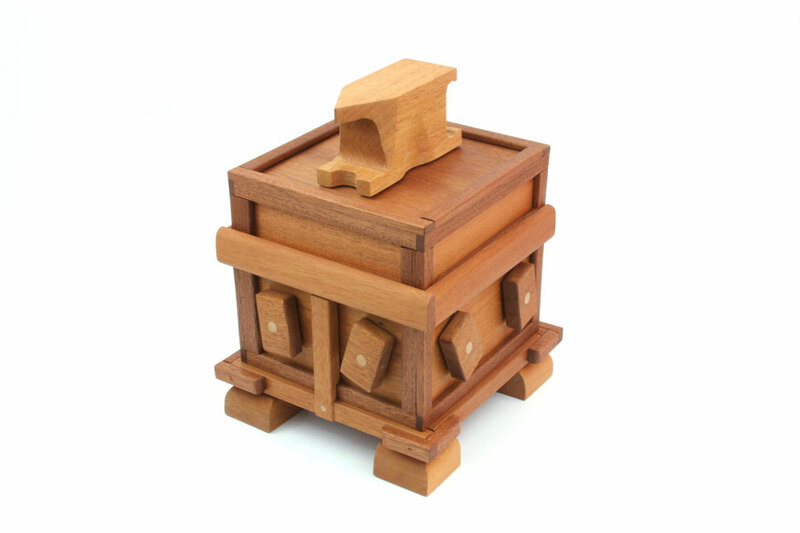 Third in a series of small, inexpensive boxes created through a collaborative effort of the Karakuri Creation Group. Includes original information/solution card. Notes: 30-move trick box. 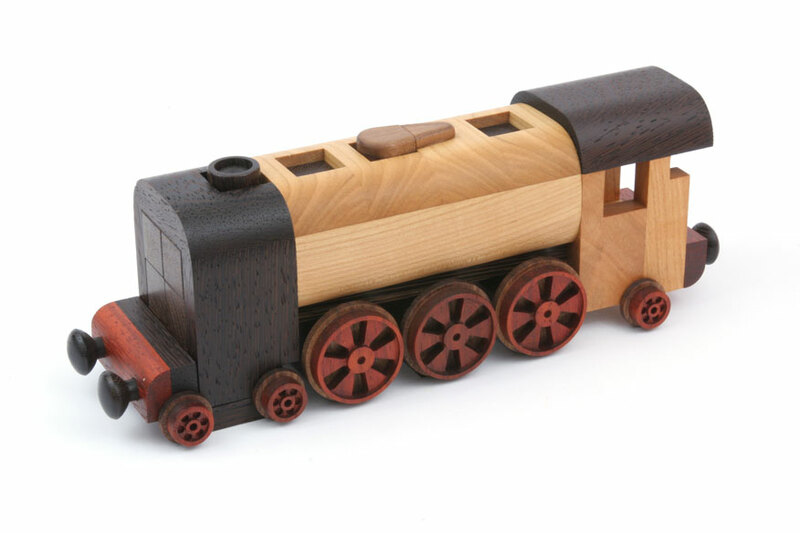 Made from Indonesian rosewood and Honduran mahogany. Signed and numbered #33 of 40. 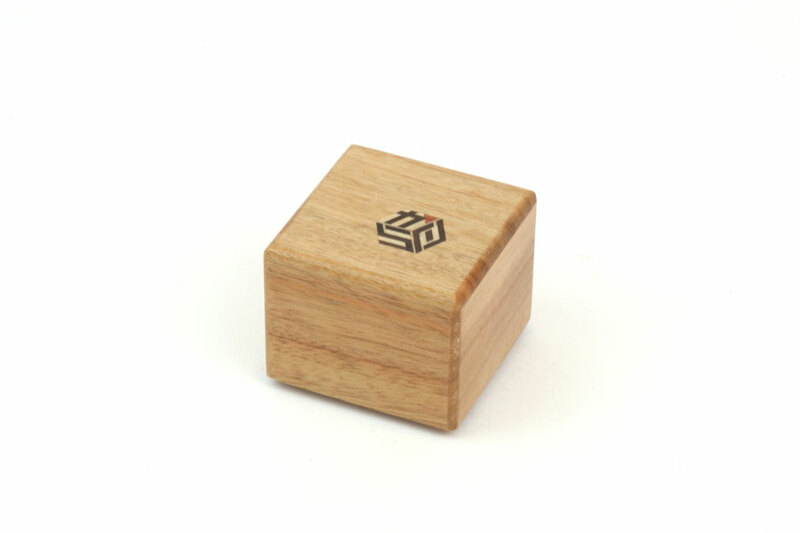 Additional information at Cubic Dissection archive. Notes: Open the trick box. This was a 2008 Karakuri Christmas present. Includes original box and copy of solution sheet. 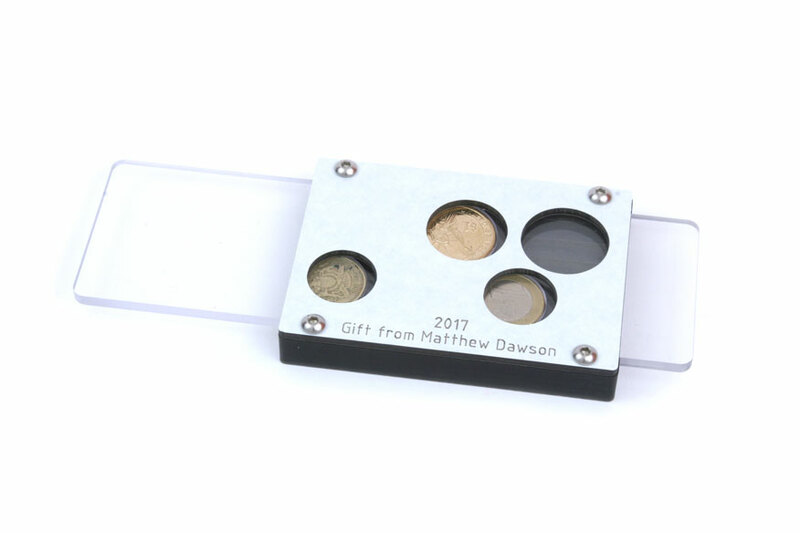 Notes: 3-dial combination lock can be configured to a personalized setting, typically matching a significant date or holiday. Includes original information booklet, and a template for alignment. Limited edition: #81 of 95; early version with decorative inlays on side panels. Initial setting is noted in the information booklet. Flaws in finish on front (see photo). 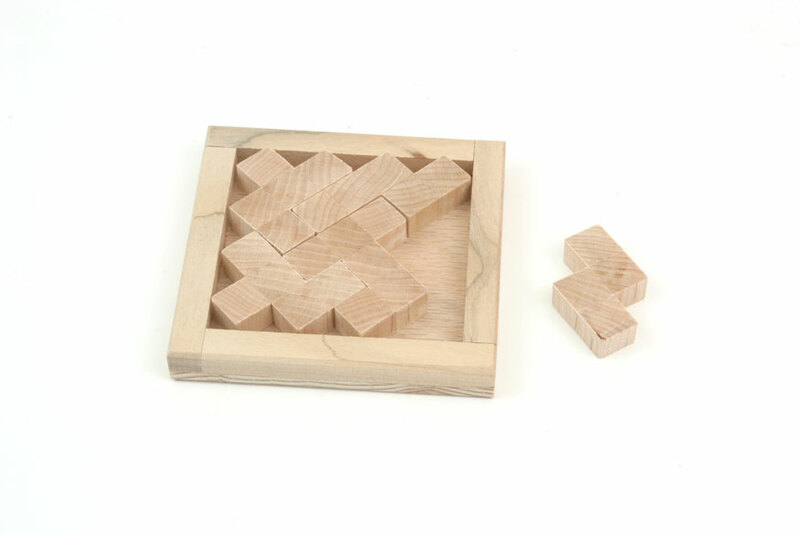 Notes: 23-piece sliding block puzzle must be solved to open the first compartment; additional moves open a second compartment. Made from padauk, monterillo, and Honduran rosewood. Tile pattern is "Sunflower". Interlocking tiles generally move smoothly, but sometimes require extra adjustment (typical for this design). Inscribed with Stickman logo and dated 10-07. Limited edition, #19 of 35 (but only 20 made, with about five of each of four patterns). Includes PDF copy of original solution card. Notes: Open the trick box. This was a 2016 Karakuri Christmas present. Includes original box and copy of solution sheet. Notes: Goal is to open second drawer compartment. Solution movement is challenging. This was a 2016 Karakuri Club Christmas present. Includes original box, hint card, and copy of solution sheet. Notes: Break into the coin bank. This was a 2016 Karakuri Club Christmas present. Includes original box and solution sheet. Notes: Open the trick box. This was a 2016 Karakuri Club Christmas present. Includes original box and copy of solution sheet. Notes: Level-48 burr. 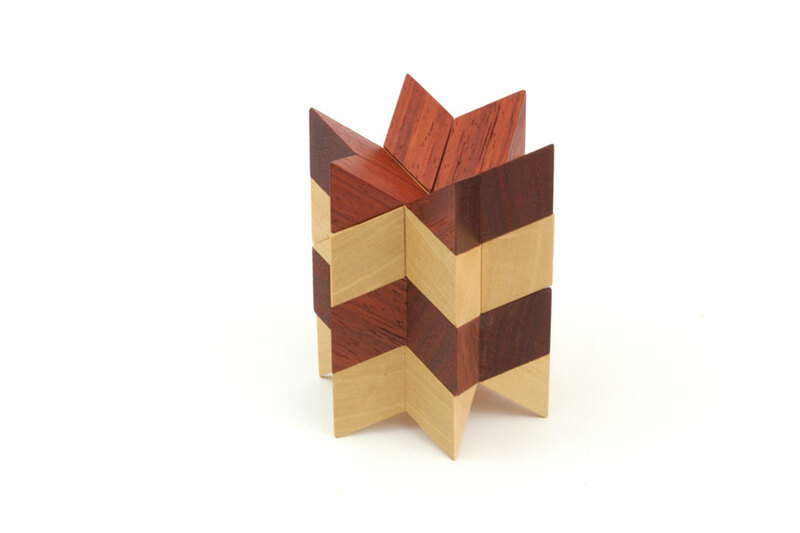 Made from wenge, padauk, cherry and walnut. Limited edition, #15 of 50. BurrTools solution available upon request. 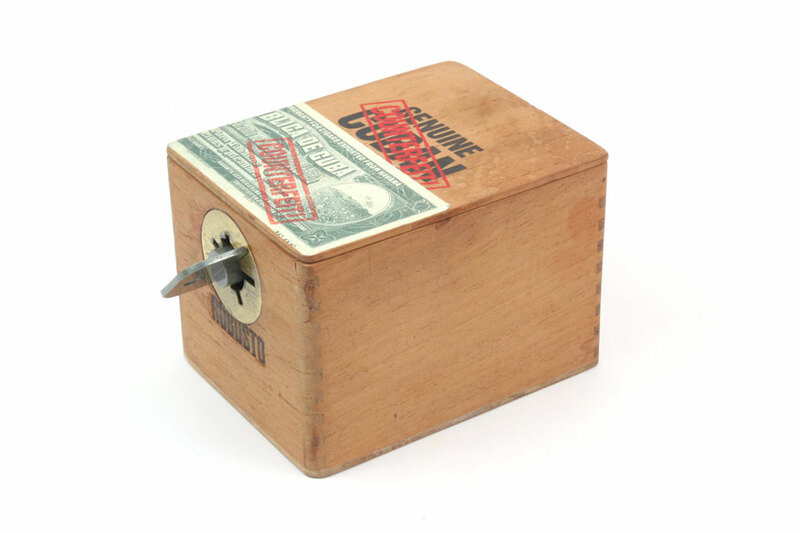 Notes: Cigar box locked by repurposing Oskar van Deventer's Keymaze (from Bits & Pieces). 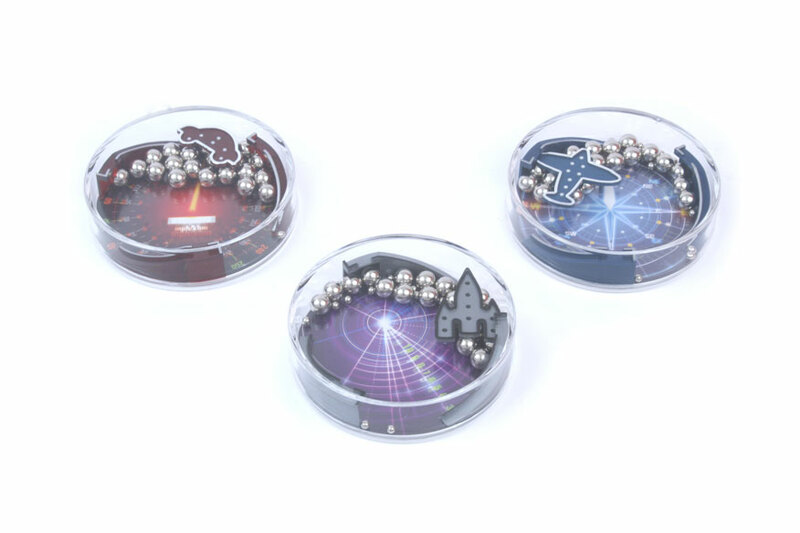 Each with a metal ring to facilitate wall hanging. Notes: Trick opening box. Considering a prototype, this was started in 2014 with the initial run, and completed early this year for the purpose of benefit auction. 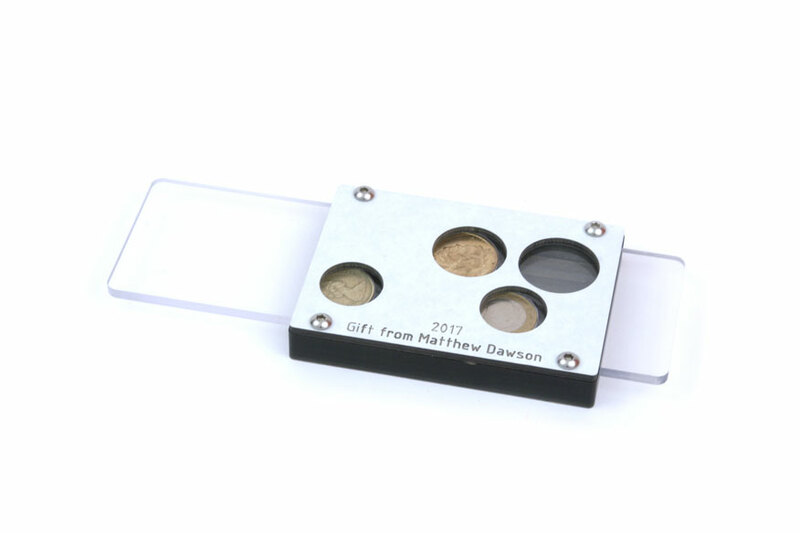 Limited edition of 5, stamped #004. Includes original information sheet. Notes: Open the box and release the anvil! The original craft cocktail bar in Houston, "Anvil Bar and Refuge", remains one of the best locally and is also recognized nationally on many top 10 lists. 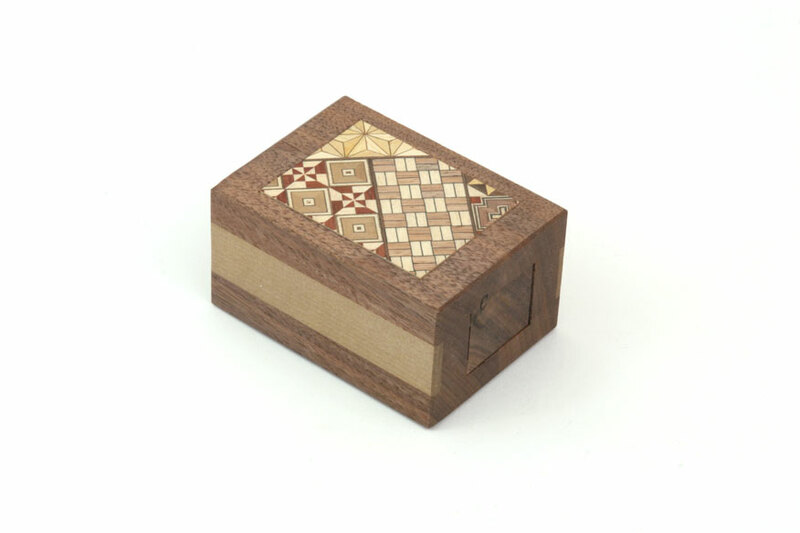 This puzzle box was commissioned as a tribute to the bar. On top of the box sits an anvil which is fixed in place. 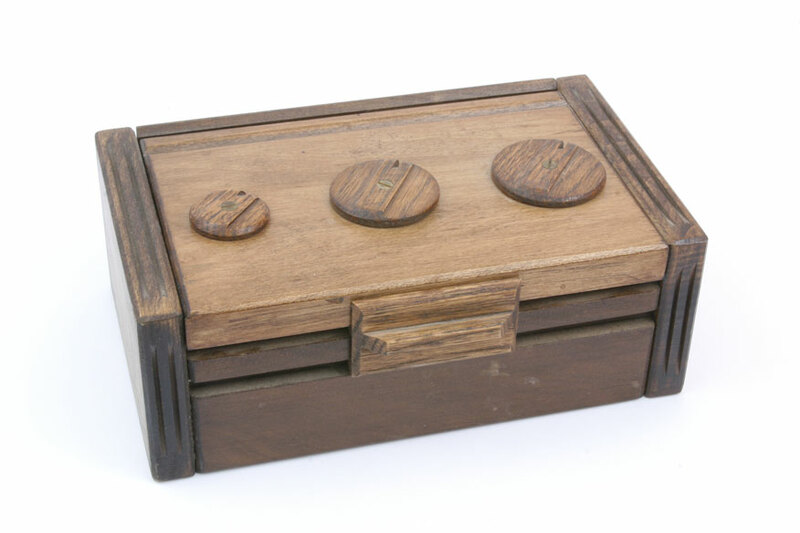 There are eight knobs surrounding the box, and they may wiggle a bit but do not turn. 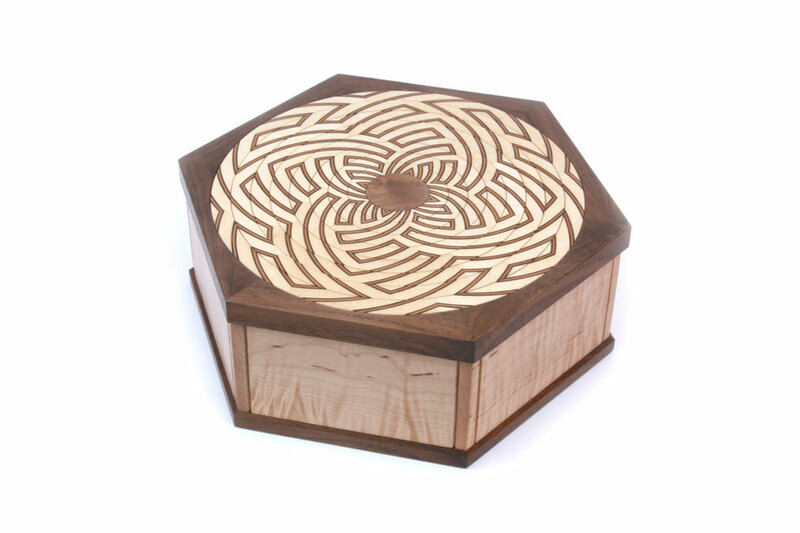 You must find the way to open the box. This requires approximately 12 moves to accomplish, including a very sneaky move to get things started. 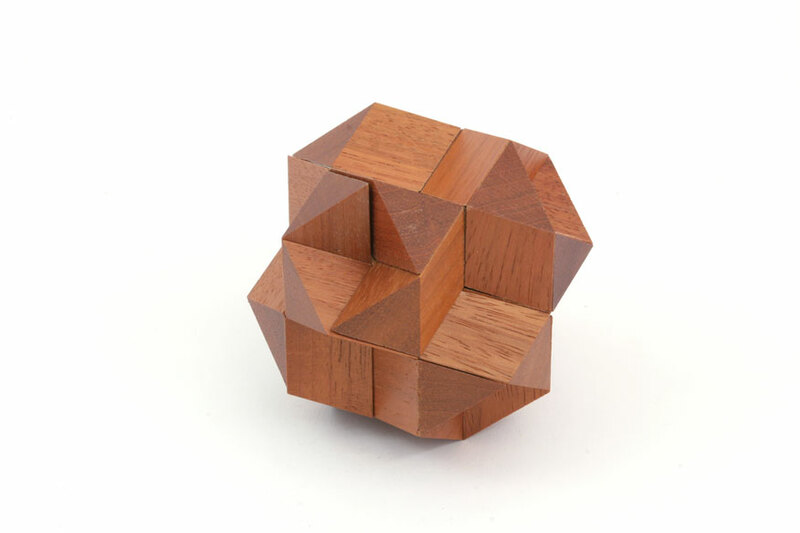 Once opened, the box reveals an internal packing puzzle of four pieces forming a cubic structure. Further inside there is a special object you will discover as well. Finally you must figure out how to release the anvil on top and you have completed the puzzle. 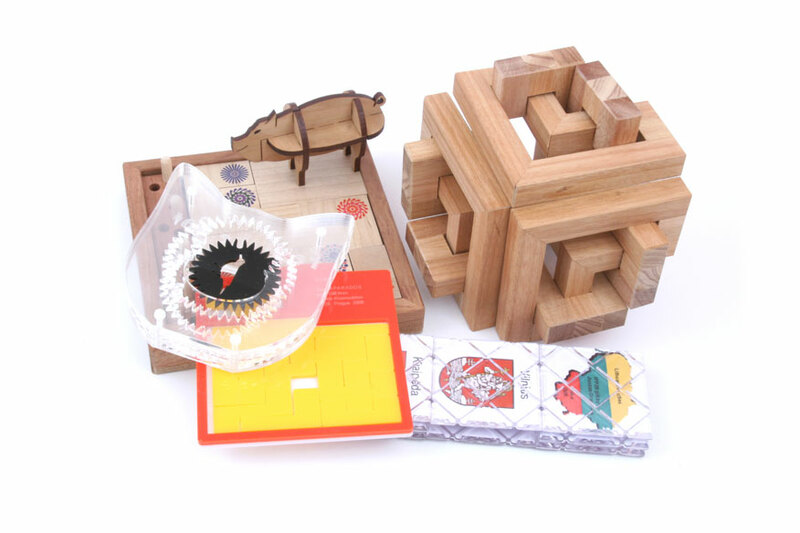 The puzzle is a lot of fun and includes 3 separate goals - open the box, mix up and resolve the packing puzzle, and free the Anvil from the top. 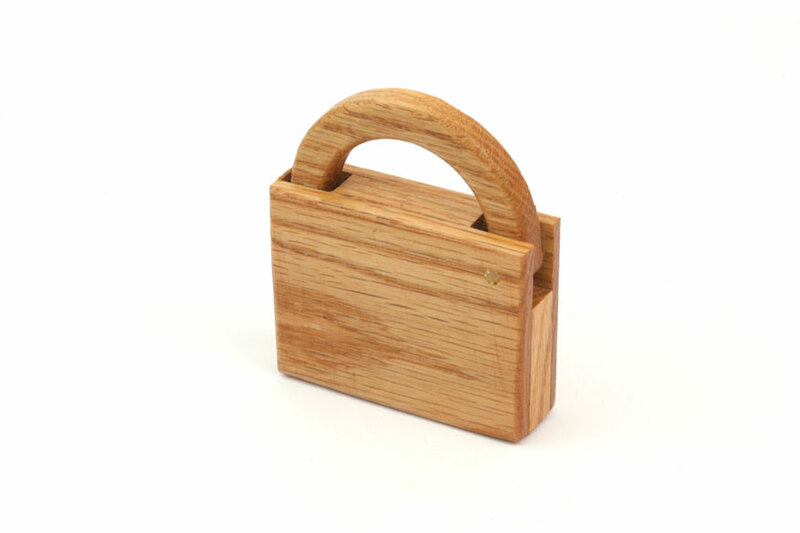 Made from mahogany, walnut, and oak. Limited edition, #2 of 2. Some moves are tight. Includes original certificate and solution sheet. Two copies were commissioned, one for the collector and one intended for the "Anvil" bar. However that plan has changed, and the funds from the sale of the second copy will now go to a worthy cause and will not be used personally. Notes: This is a second variation of Locked Nest, using six elbow pieces; made from 1/2" walnut dowels and 1/4" birch pins. One piece inscribed "STC, 2016, #6, 22-C". Includes original box. Notes: Once key piece, inscribed "31-A, STC, 2015" Slightly loose fit. Includes original box. 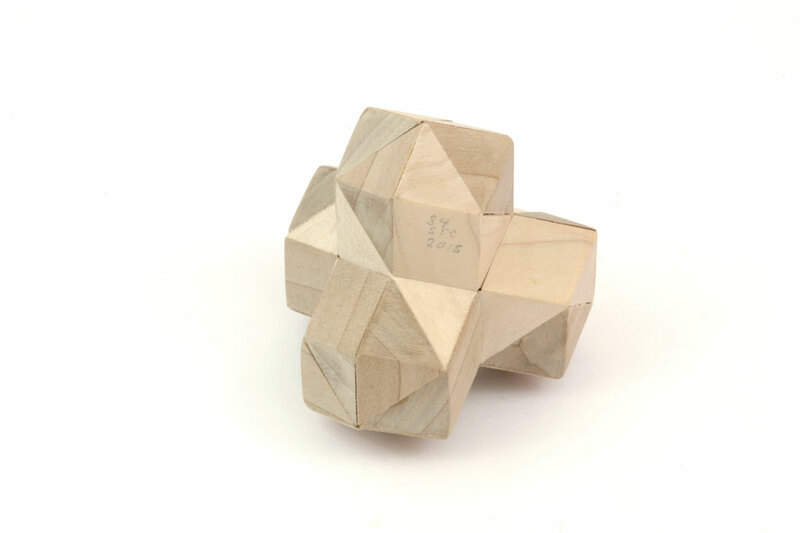 Notes: Made from six dissimilar non-symmetrical pieces, and assembles in two halves. 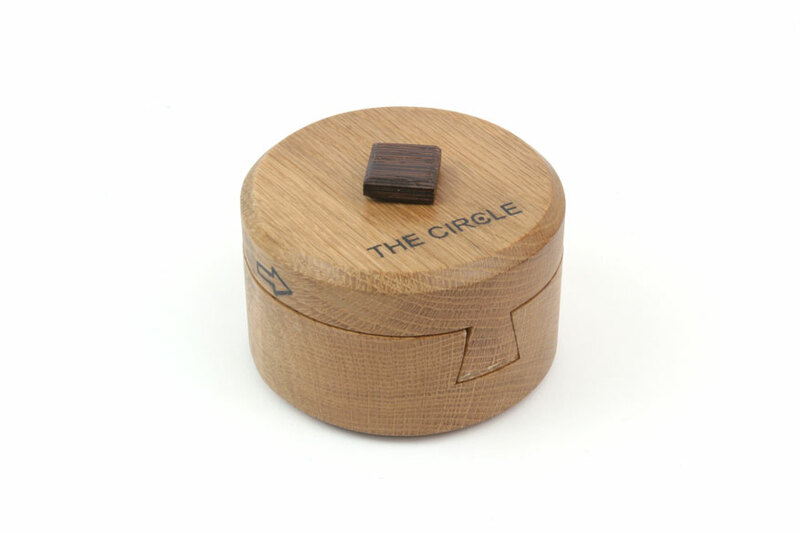 Made from poplar; one piece inscribed "34, STC, 2015". Rough model, with interior pencil marks indicating assembly. 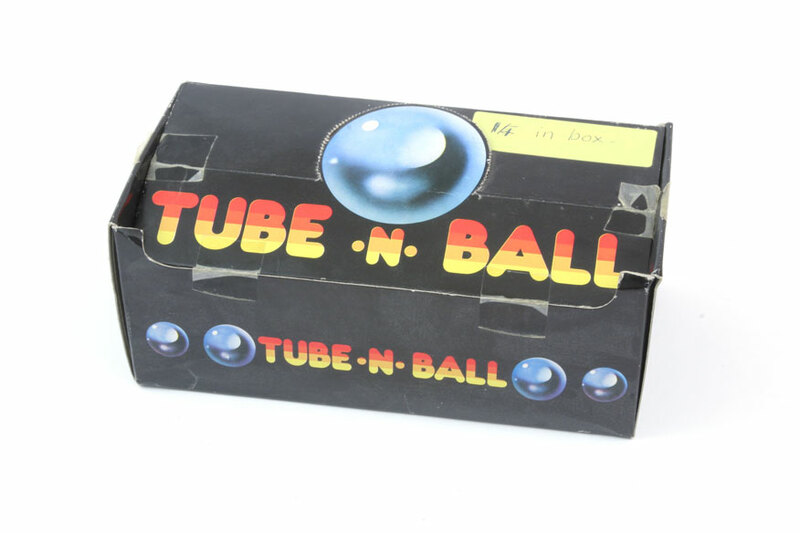 Includes original box. Notes: One piece inscribed "38, STC, 2015". 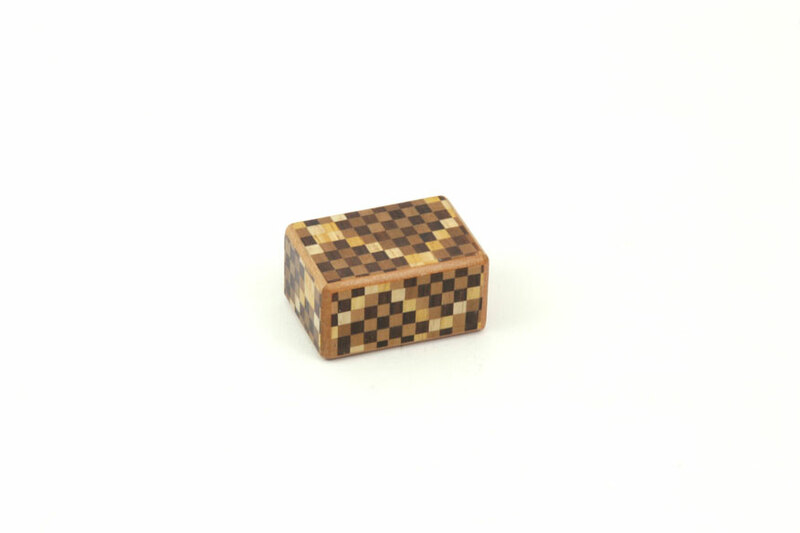 Made from zebrawood; slightly loose fit. Once piece has interior pen marks. 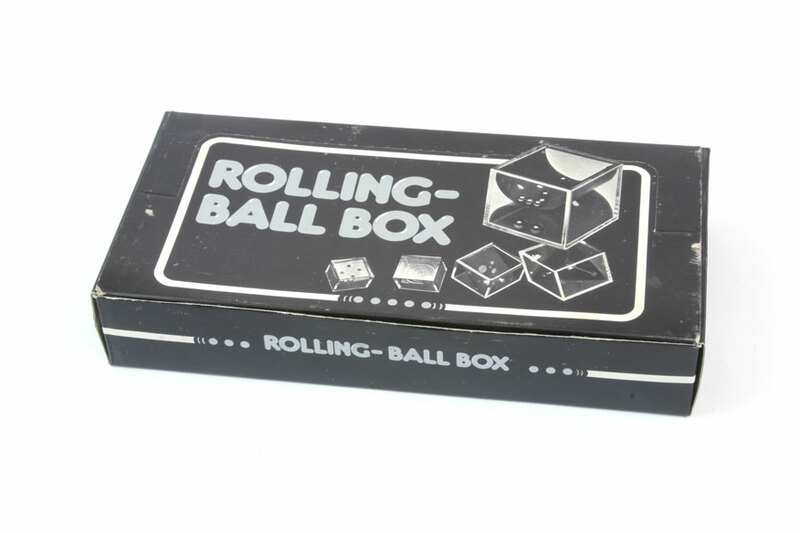 Includes original box. 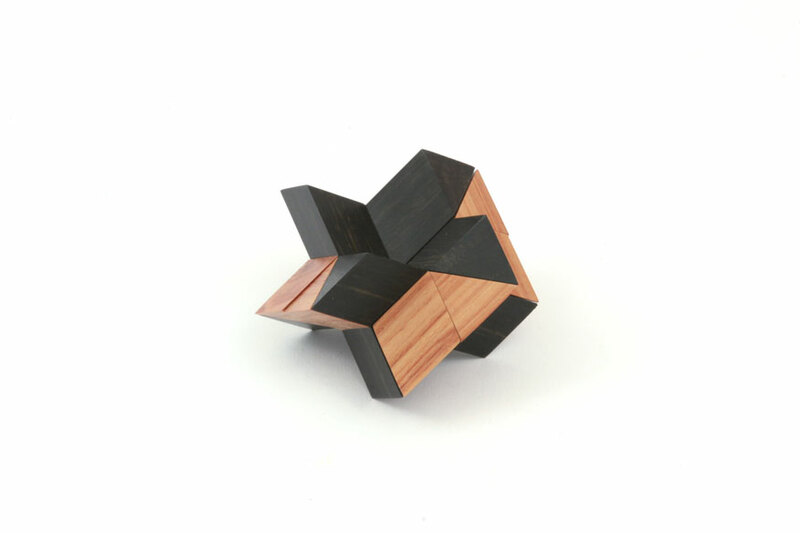 Notes: Experimental Garnet design with all identical pieces and two assemblies. Very loose fit; only one made. One piece inscribed "60-X, STC, 2015". Includes original box and hand-written index card. 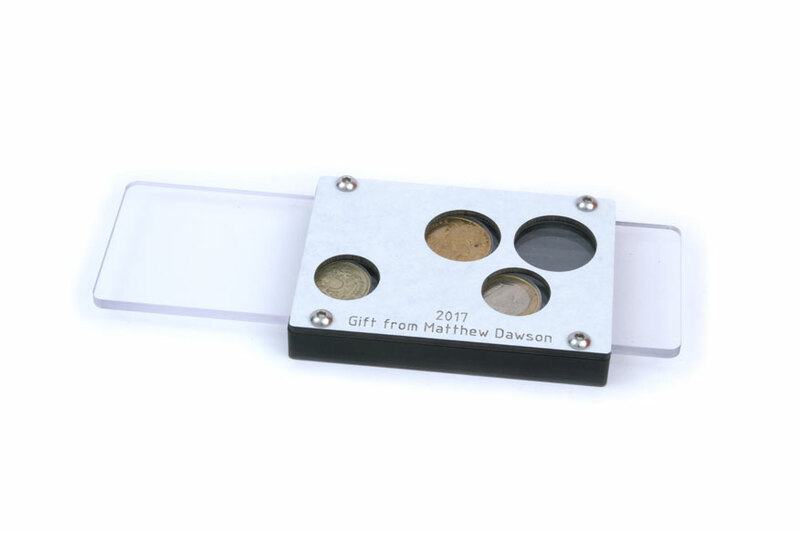 Notes: 6-piece burr with sticks rotated 5 degrees along their long axis. Made from poplar. Slightly imprecise cuts, and very tight movement. One piece inscribed "96-A, STC, 2016". Includes original box and copy of information sheet. Notes: 6-piece burr with sticks rotated 5 degrees along their long axis. One piece inscribed "96-A, STC, 2016", and with slight stain (see photo). Includes original box and copy of information sheet. Notes: Pack the five pieces into the tray. Solution is slightly tight. 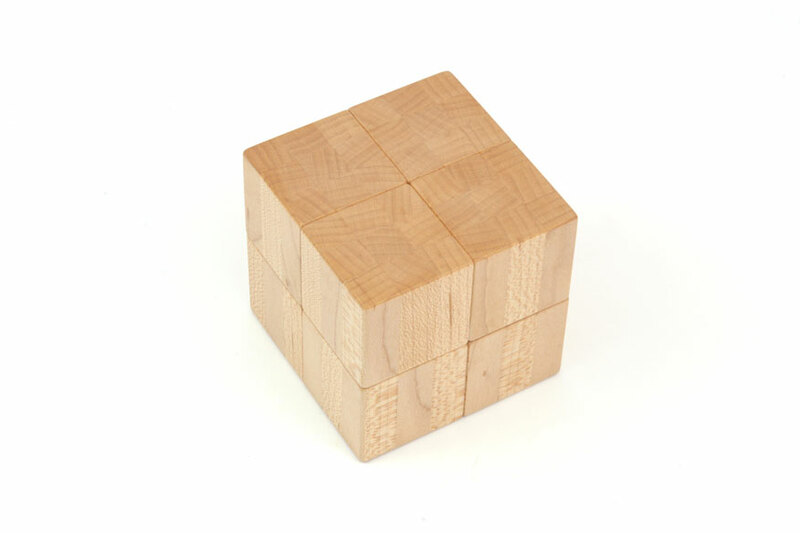 This was the IPP35 Exchange puzzle from Bill Cutler. Includes original information card. 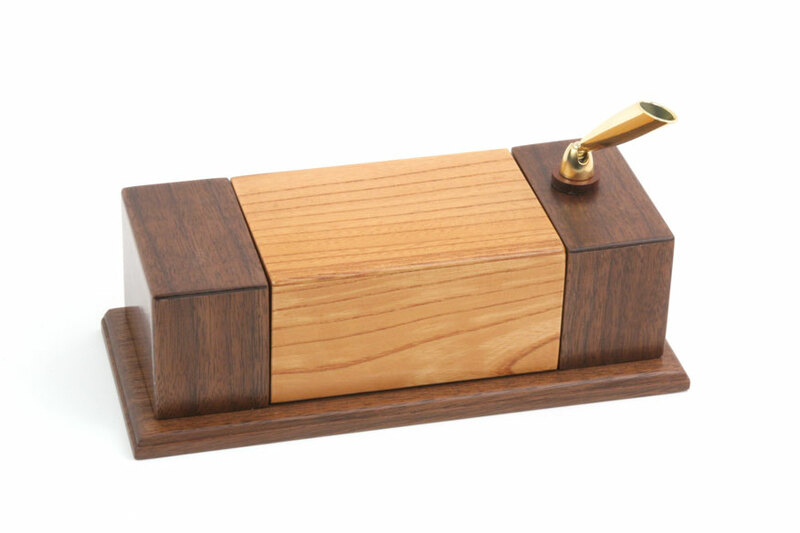 Notes: Trick opening box for business cards. Limited edition of 30, dated 2015. Includes original solution sheet. Notes: Unusual 4-move trick box. One panel warped (see photo), but puzzle still operational. 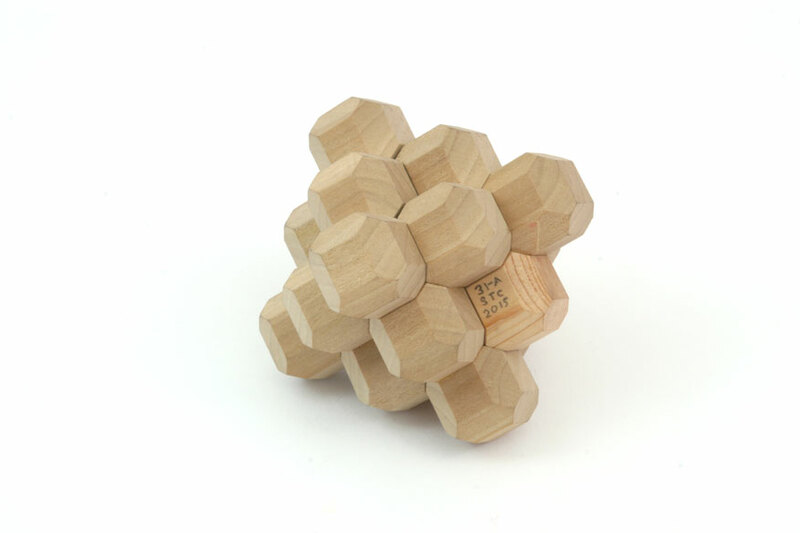 The was the IPP12 exchange puzzle from Koji Hirotsu. Includes original information card and solution sheet. 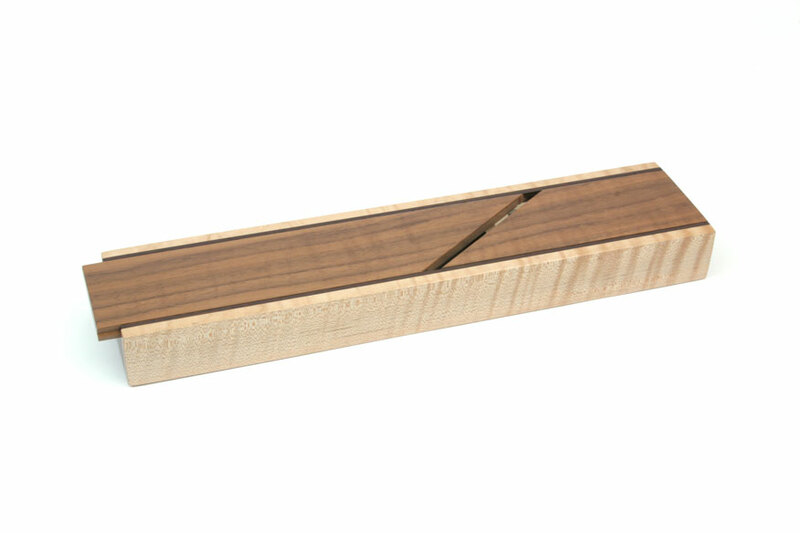 Notes: Wooden trick opening lock. Includes original solution sheet. Notes: Negotiate the hidden maze to remove the three coins. Includes solution diagram. Notes: Coffin design #85; twelve pieces (10 identical, one augmented, and one key) fit together to form a symmetrical shape; made from paroba rosa. Dings on one corner and on one edge. Notes: Coffin design #85; twelve pieces (10 identical, one augmented, and one key) fit together to form a symmetrical shape; made from paroba rosa. One corner slightly chipped. Notes: Coffin design #85; twelve pieces (10 identical, one augmented, and one key) fit together to form a symmetrical shape; made from paroba rosa. One corner dinged. Lot 5092 - Fancy This! Notes: Coffin design #115-A. 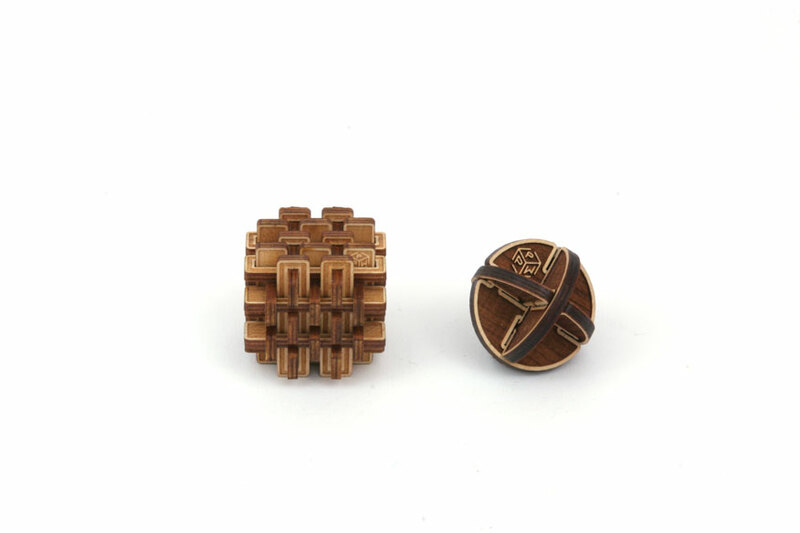 Seven pieces form the classic cluster shape, but instead assemble with both coordination motion and serial interlocking. 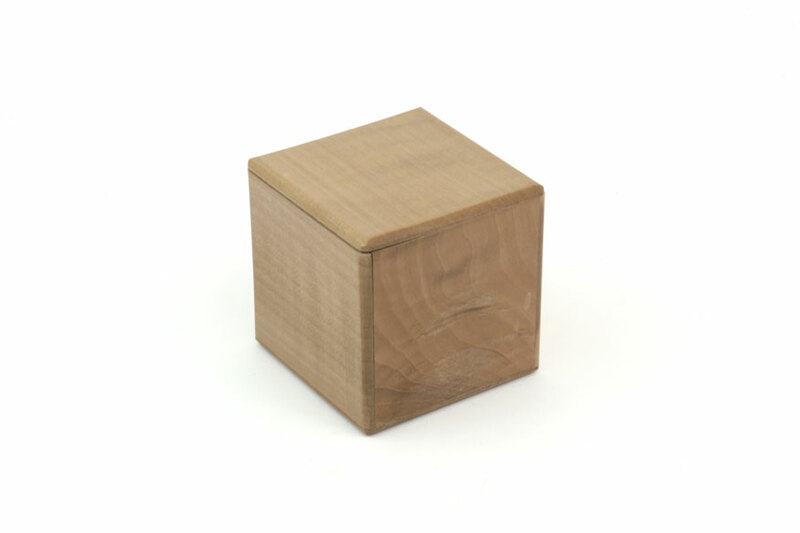 Made from jatoba; inexact fit in places (see photo), and slight wear. This was the IPP17 exchange puzzle from Nick Baxter. Notes: Coffin design #12, made of six dissimilar pieces. Very loose/inexact fit in places (see photo). This was the IPP18 Exchange puzzle from Nick Baxter. Notes: Coffin Design #15-A, same as Triumph except that two pairs of pieces are fused together. Made from padauk and maple; slight wear and slightly loose. 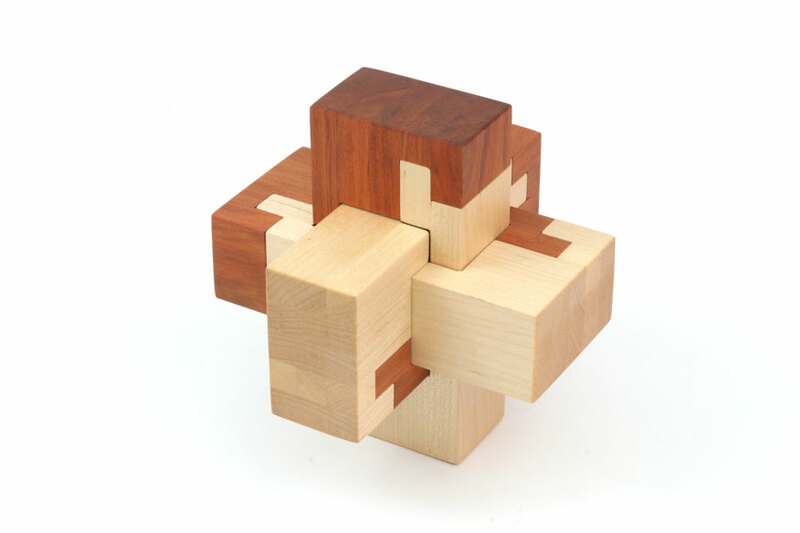 This was the IPP19 Exchange puzzle from Marti Reis. Notes: Coffin design #9-A, a variation of the classic Altekruse using pins and holes instead of notches. Two surface chips due to manufacturing. 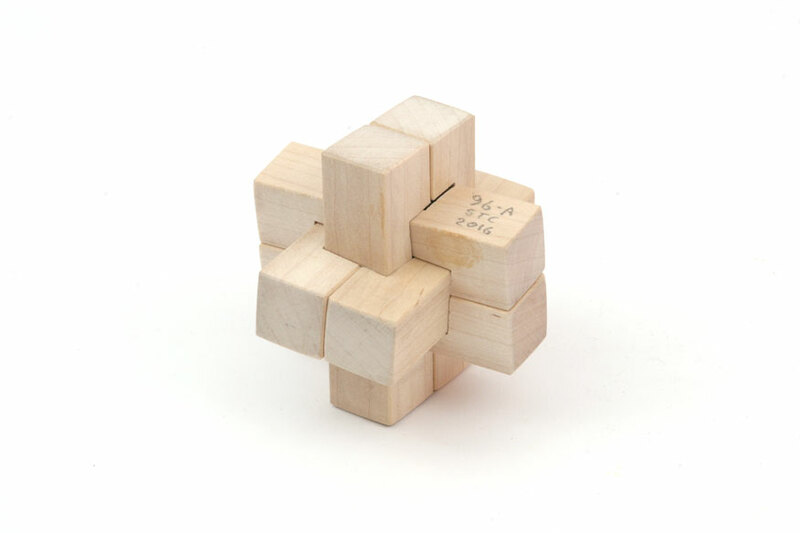 This was the IPP18 Exchange puzzle from Marti Reis. Notes: Coffin design #95; six dissimilar piece assemble multiple ways. Made from padauk and maple; tight/uneven fit in places. 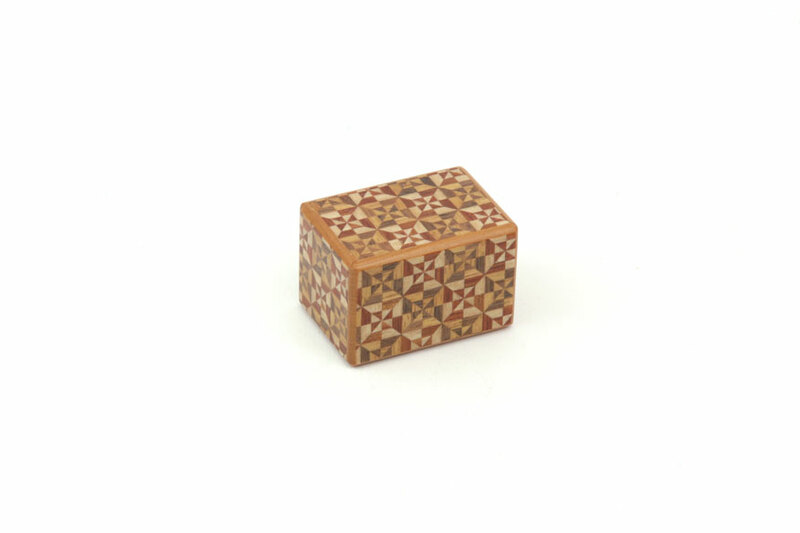 One pieces stamped "Interlocking, puzzles, 2001". Notes: Coffin design #95; six dissimilar piece assemble multiple ways. Made from padauk and maple; tight/uneven fit in places. Notes: Coffin design #37; confusing diagonal assembly. 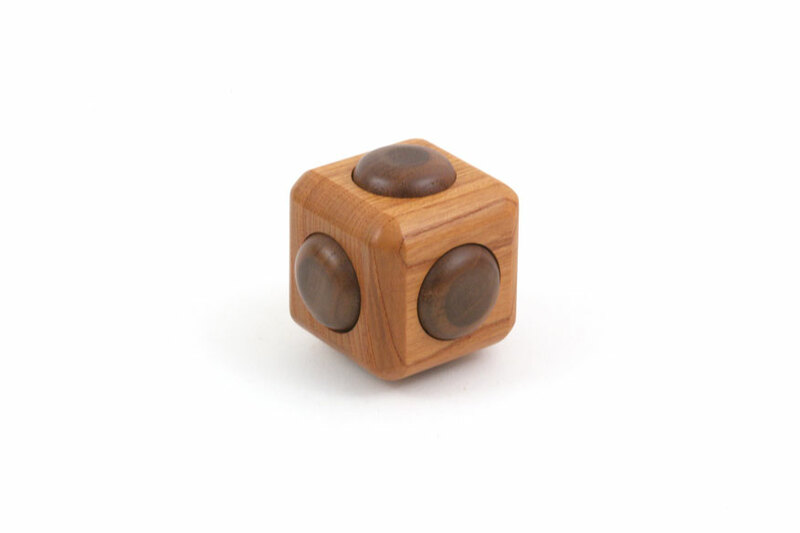 Made from padauk and maple; excellent fit and movement. 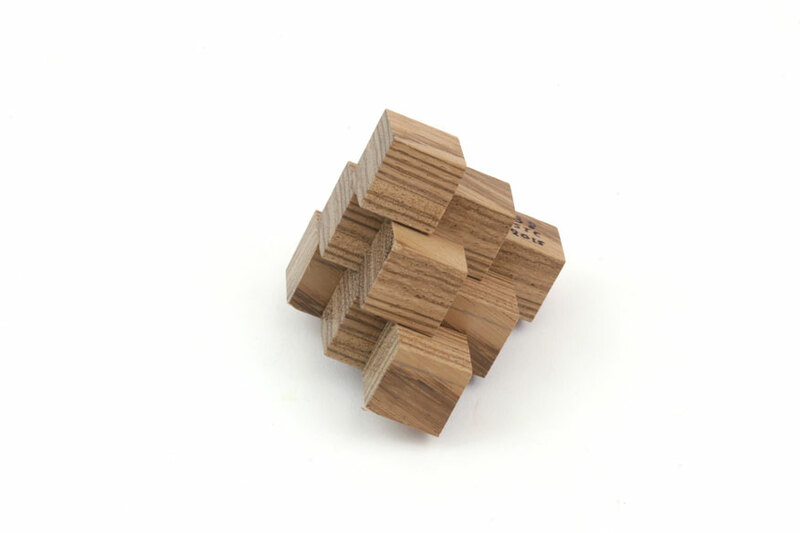 One piece stamped "Interlocking, puzzles, 2001"
Notes: Six similar pieces form a burr, inspired by Japanese wood joints. Slight surface flaws due to manufacturing. 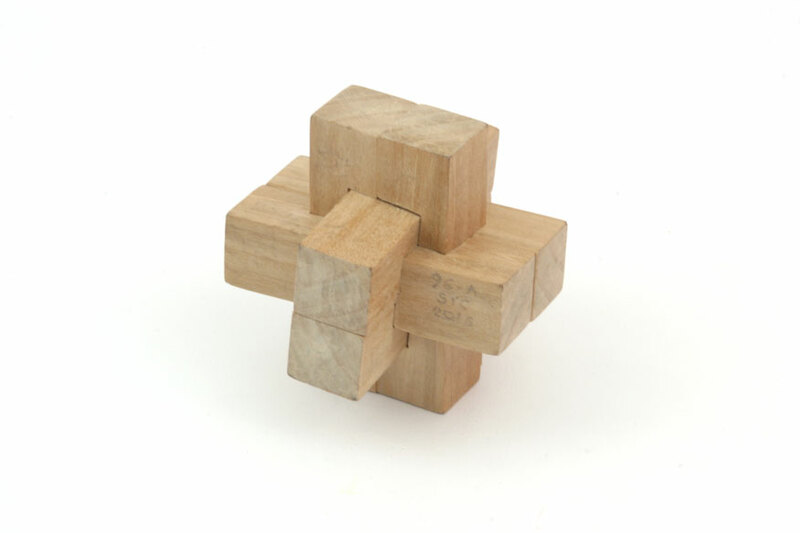 This was the IPP19 Exchange puzzle from Frans de Vreugd. Shipped disassembled (unless you request otherwise). 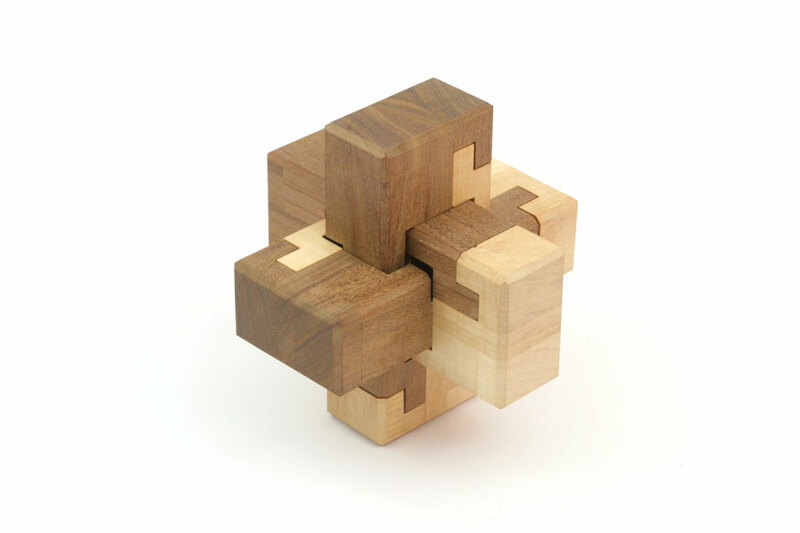 Notes: This is a very rough prototype for the Japanese Wood Joint Puzzle, made from unfinished walnut and maple. 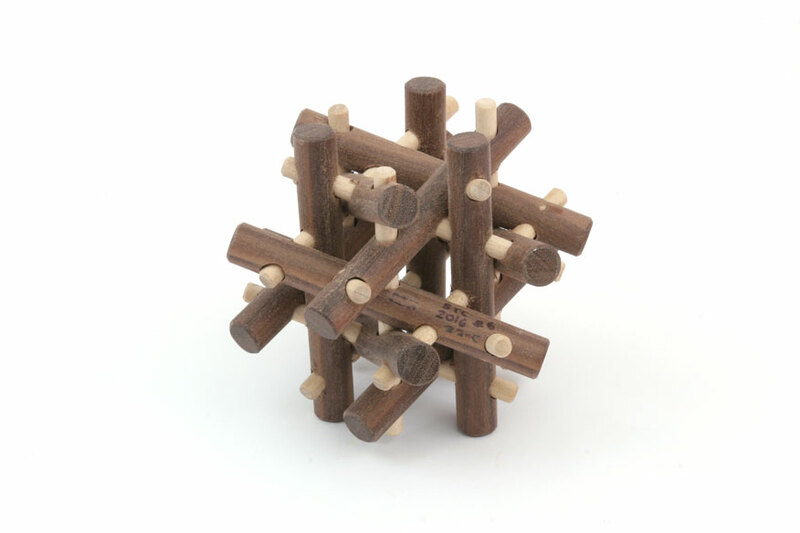 This is the same design as the IPP18 Exchange puzzle from Frans de Vreugd. Notes: Remove the box from the cage. Slight blemish on edge of box (see photo). 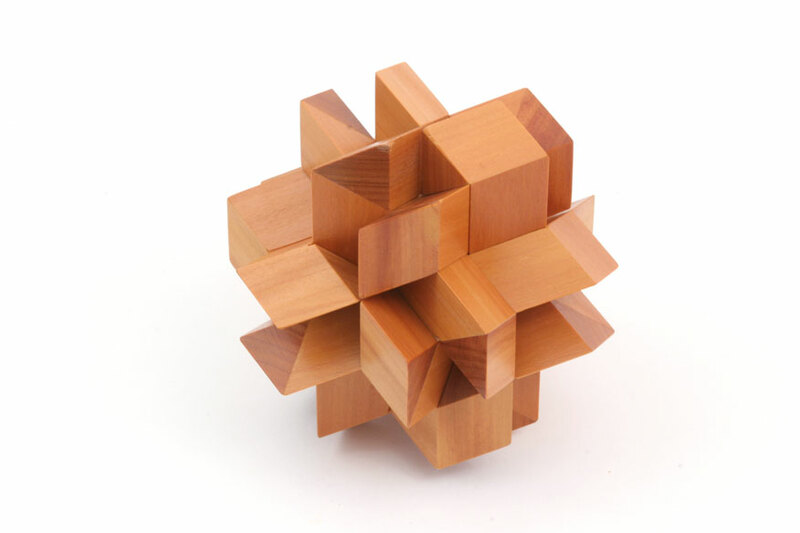 Winner of jury honorable mention in 2017 Nob Yoshigahara Puzzle Design Competition. Includes original box and copy of solution sheet. 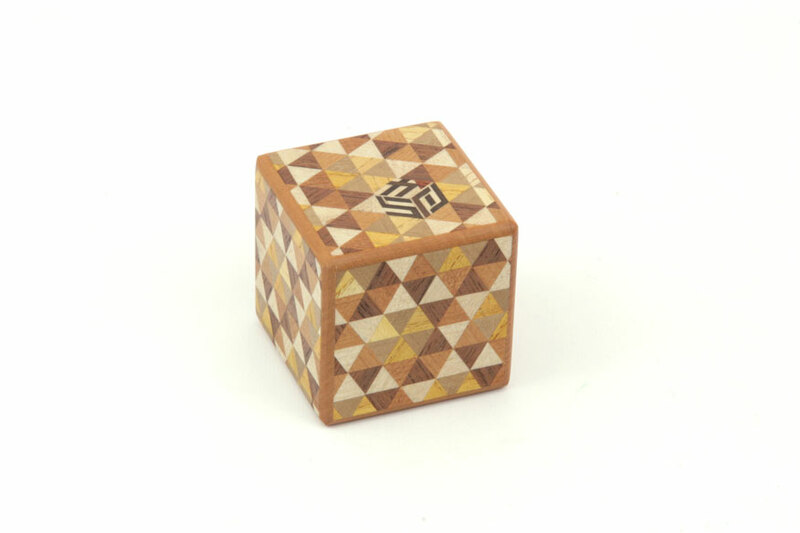 It is possible to wedge the puzzle after solving; more information will be provided to the buyer. Notes: Remove the box from the cage. 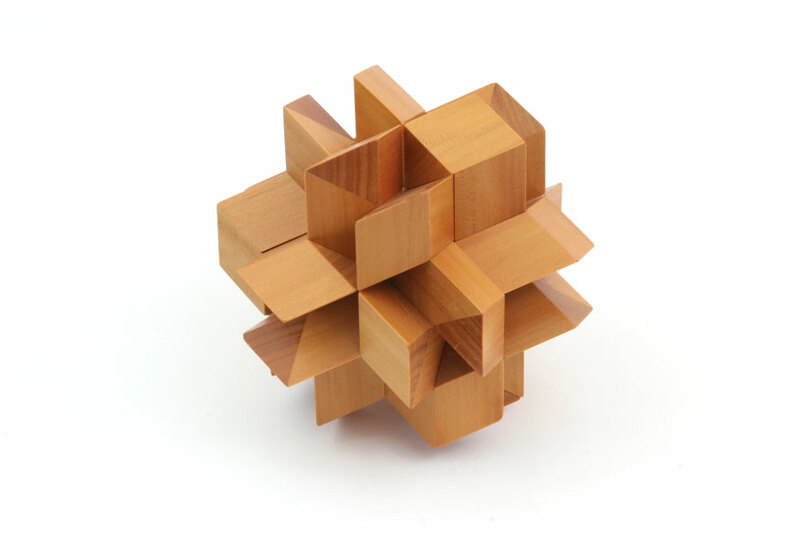 Winner of jury honorable mention in 2017 Nob Yoshigahara Puzzle Design Competition. Includes original box and copy of solution sheet. 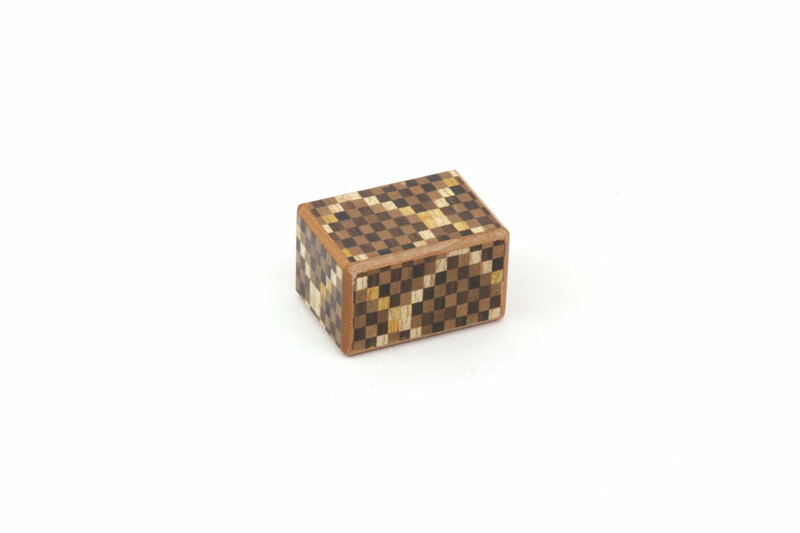 It is possible to wedge the puzzle after solving; more information will be provided to the buyer. 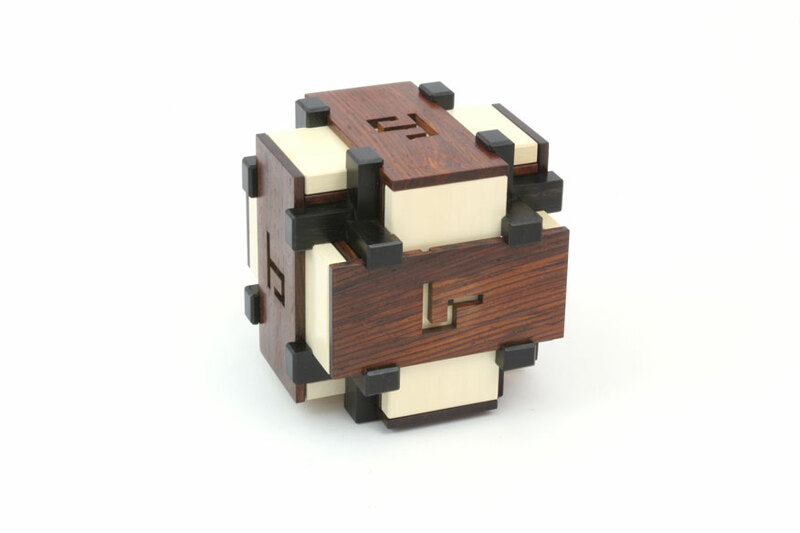 Notes: Unusual 3-move mechanism with walnut panels. 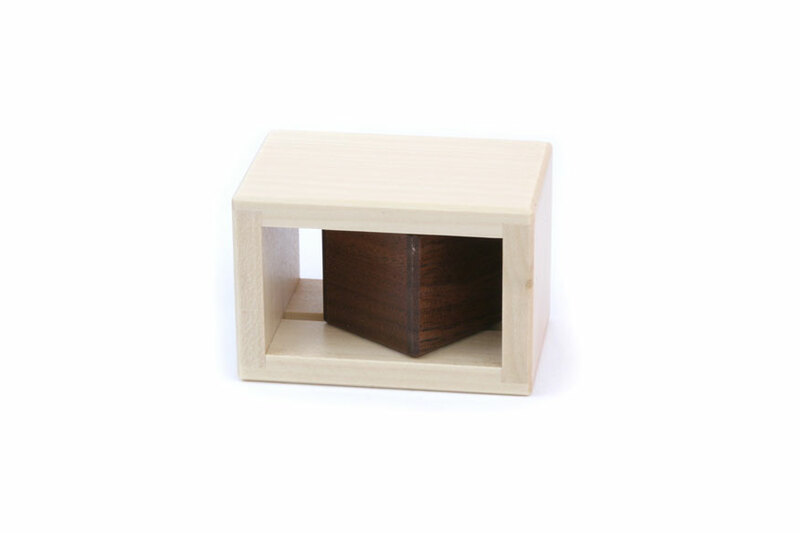 First in a series of small, inexpensive boxes created through a collaborative effort of the Karakuri Creation Group. Includes original information and solution card. Notes: 2-move trick box, with unusual move (and the first move of KK-2 was eliminated). 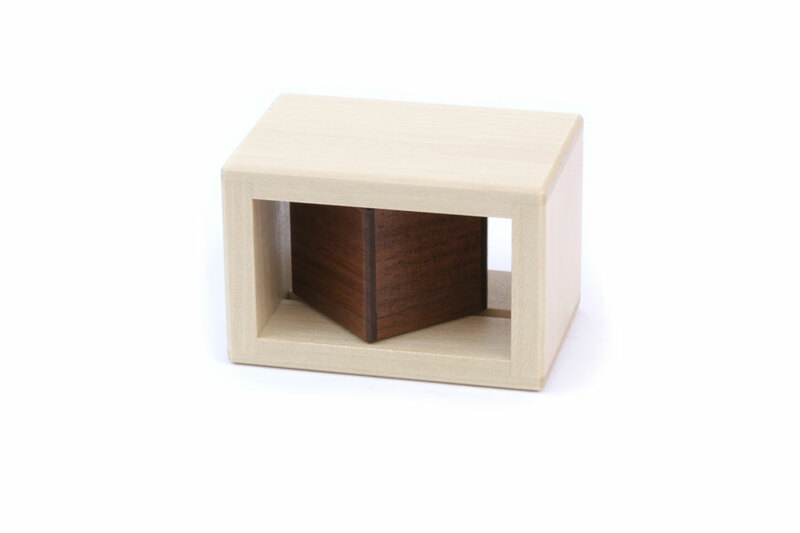 Second in a series of small, inexpensive boxes created through a collaborative effort of the Karakuri Creation Group. One small ding on top panel (not visible in photo). Includes original information/solution card. 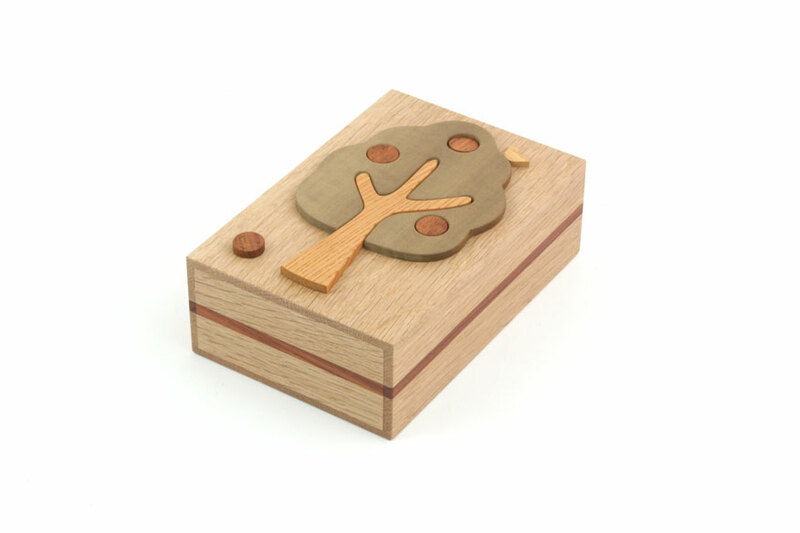 Notes: 4-move trick box, with oak panels. 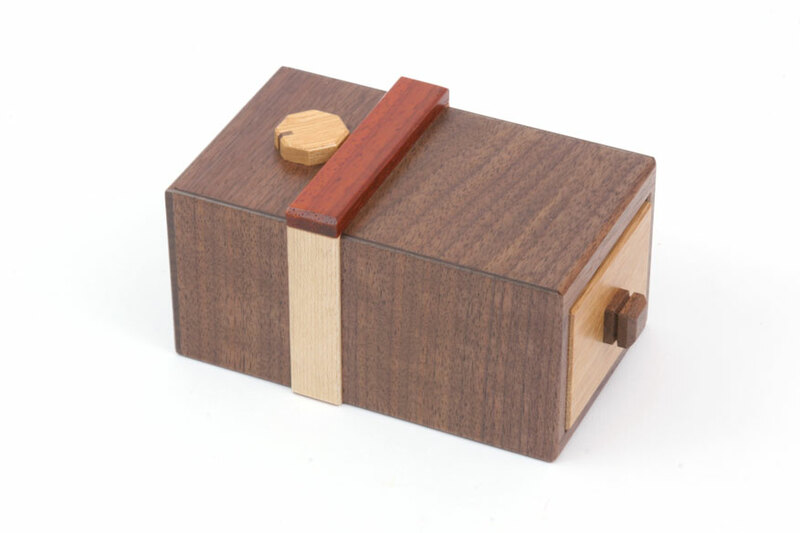 Third in a series of small, inexpensive boxes created through a collaborative effort of the Karakuri Creation Group. Includes original information/solution card. 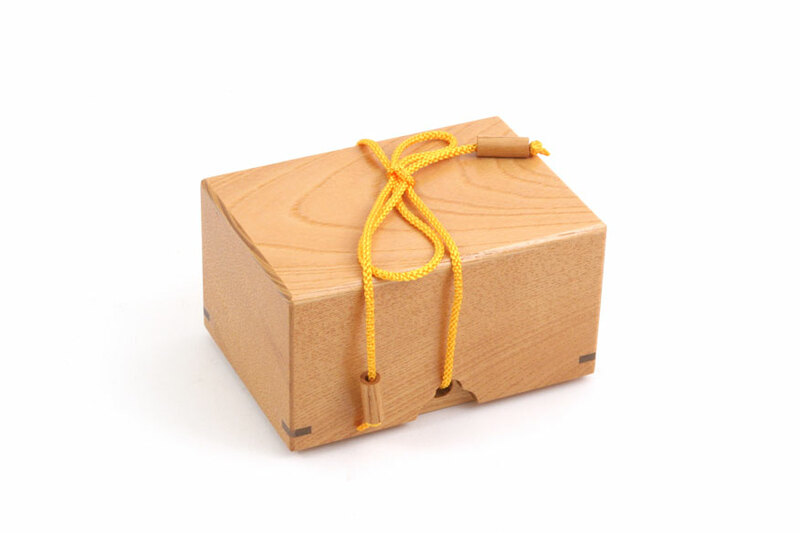 Notes: Trick box, with rengas panels; design inspired by Kamei's Box with a Ribbon (P-27). 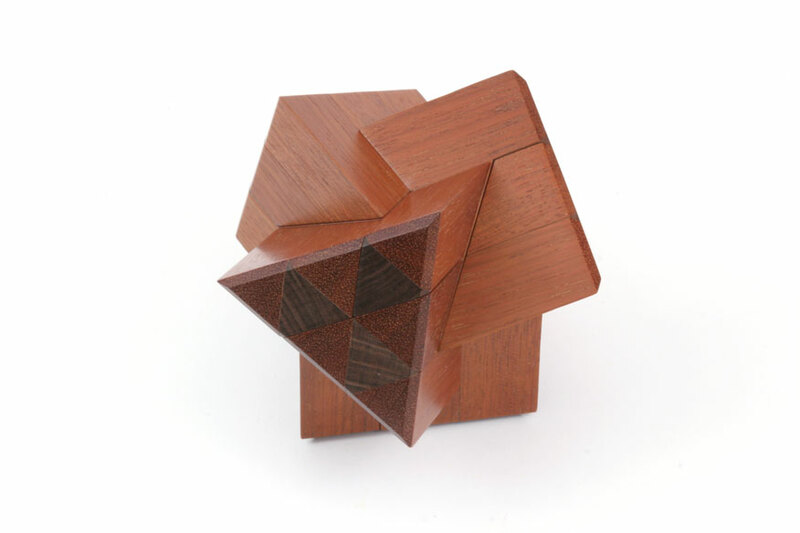 Fourth in a series of small, inexpensive boxes created through a collaborative effort of the Karakuri Creation Group. Includes original information/solution card. 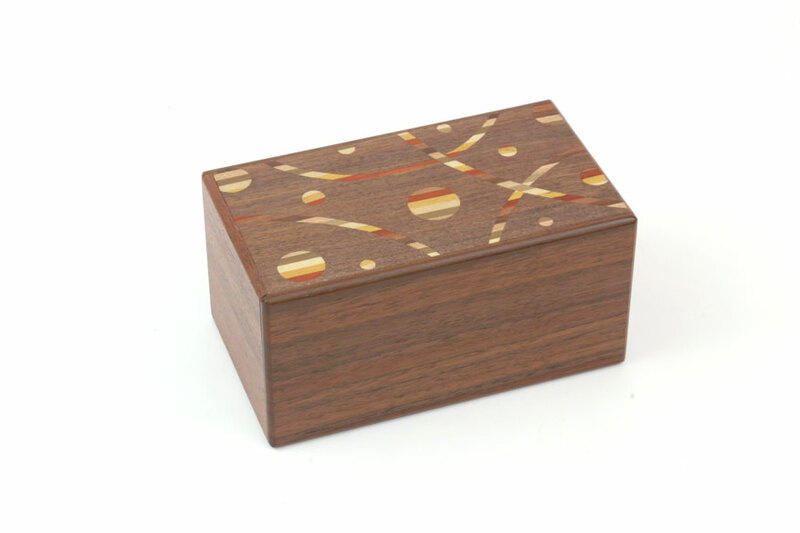 Notes: Trick box, with camphor panels; design inspired by Kamei's Cosmox Box (M-17). Very slight ding on top edge. 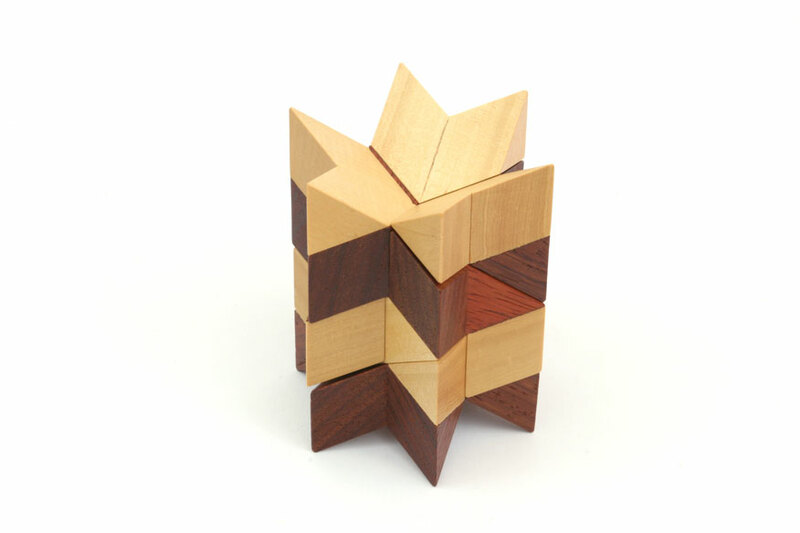 Fifth in a series of small, inexpensive boxes created through a collaborative effort of the Karakuri Creation Group. Includes original information/solution card. 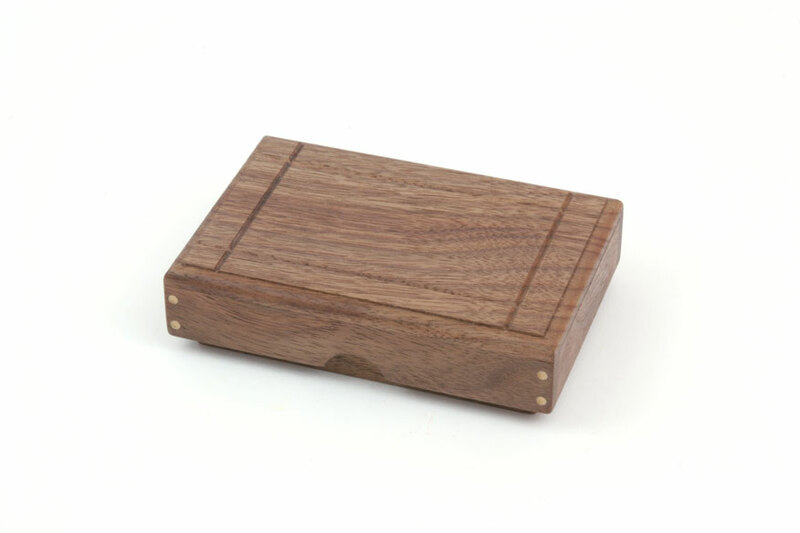 Notes: Trick box, with walnut panels; design inspired by Kamei's Top Box (M-5-1). 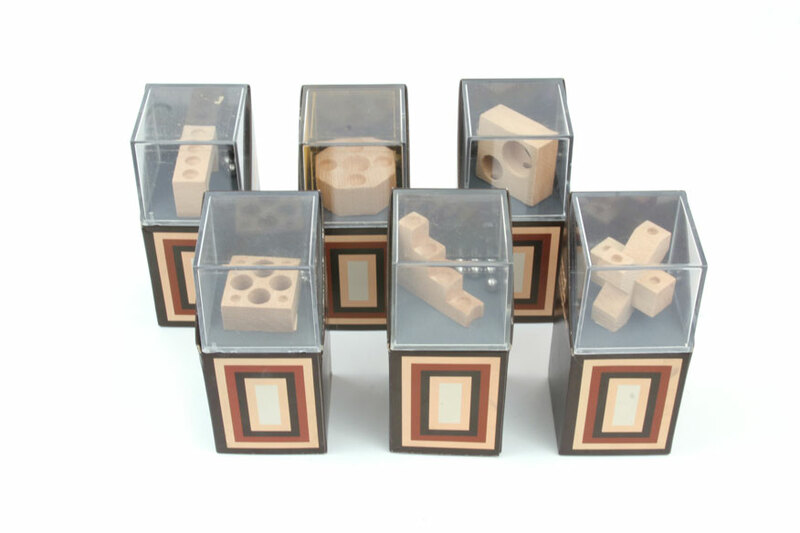 Six in a series of small, inexpensive boxes created through a collaborative effort of the Karakuri Creation Group. Includes original information/solution card. 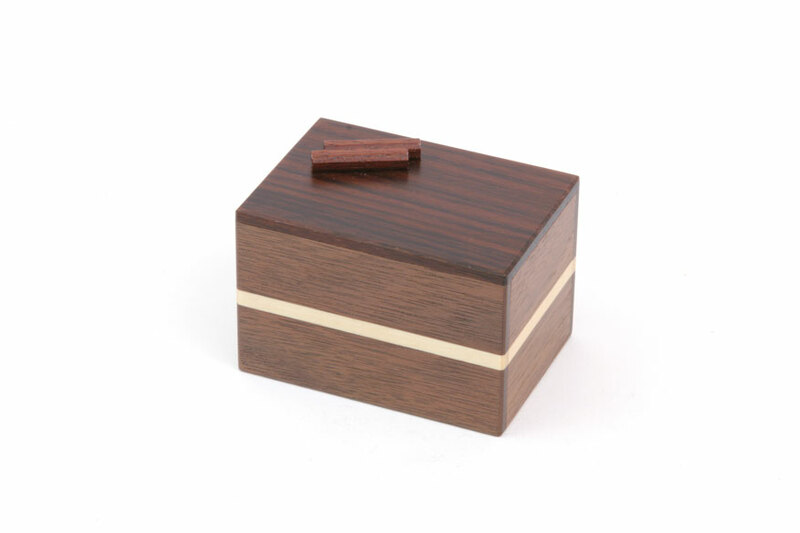 Notes: Trick box, with teak panels; design inspired by Kamei's Small Box 3 (M-24-3). 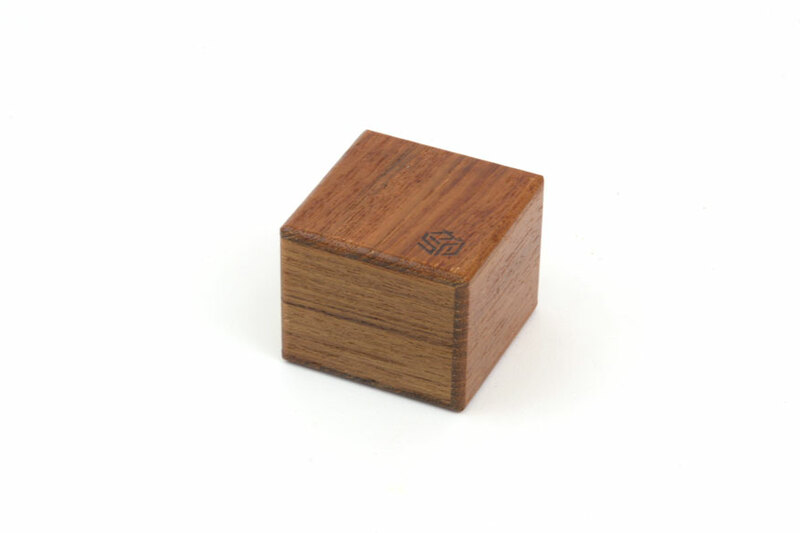 Seventh in a series of small, inexpensive boxes created through a collaborative effort of the Karakuri Creation Group. Includes original information/solution card. 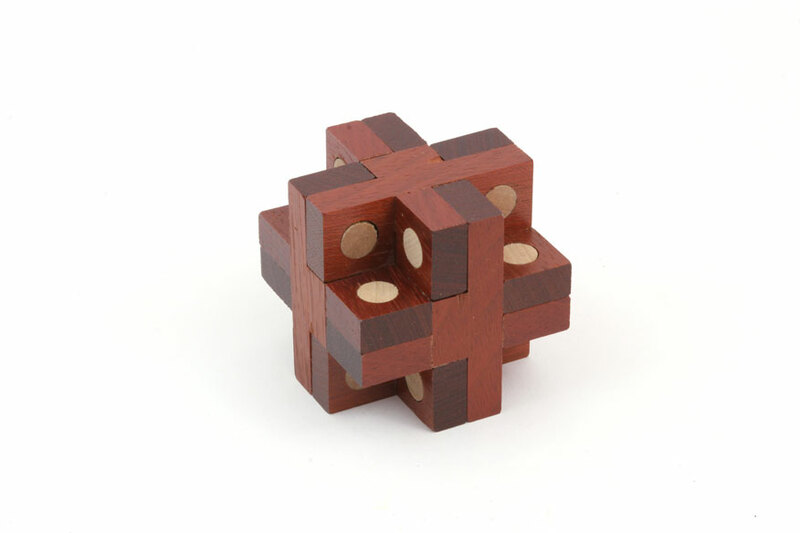 Notes: One of four different Karakuri Cake puzzles. Made from mizuki (dogwood), karin, torreya, katsura (or magnolia). Includes original information/solution card. 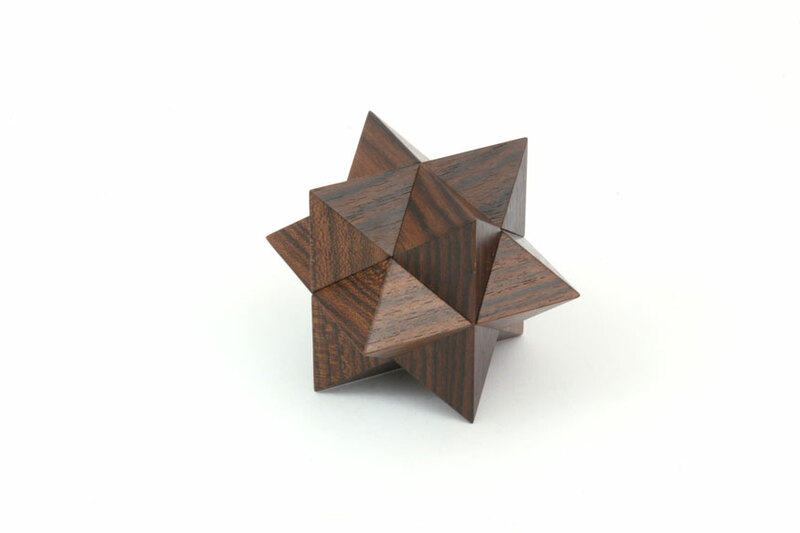 Notes: One of four different Karakuri Cake puzzles. 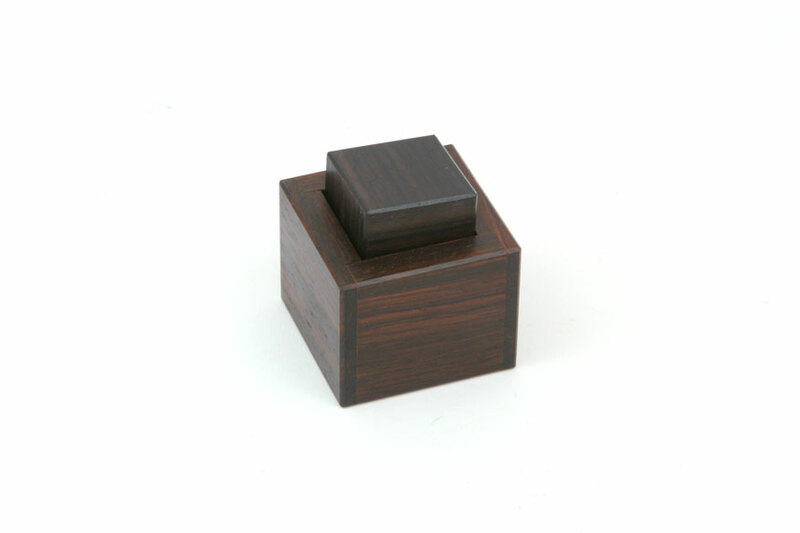 Made from rosewood, walnut, katsura (or magnolia), etc. Includes original information/solution card. 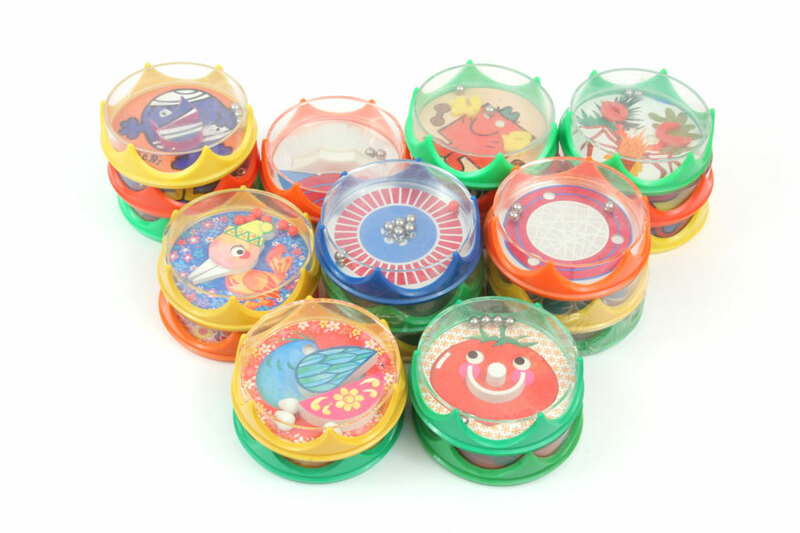 Notes: One of four different Karakuri Cake puzzles. 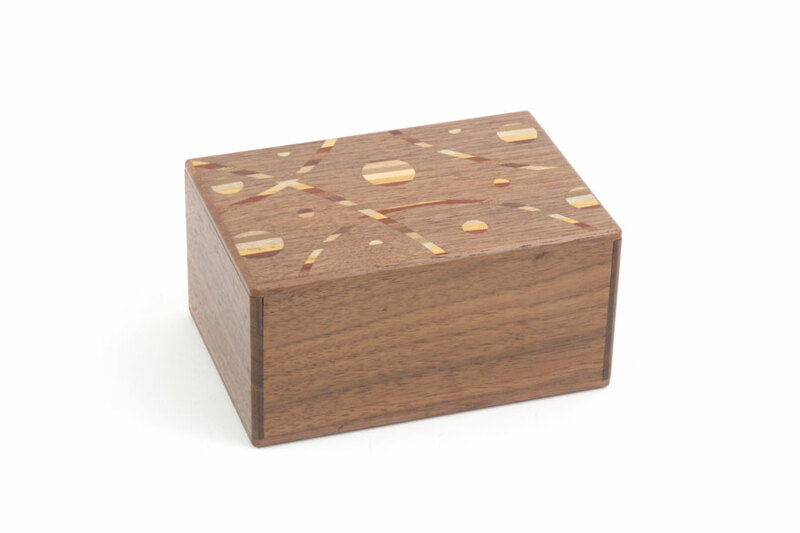 Made from zebrawood, mizuki (dogwood), walnut, katsura (or magnolia). Includes original information/solution card. Notes: Coffin design #12. Overall excellent condition. One piece inscribed "Lee, 3.02, SC.12, No.1". 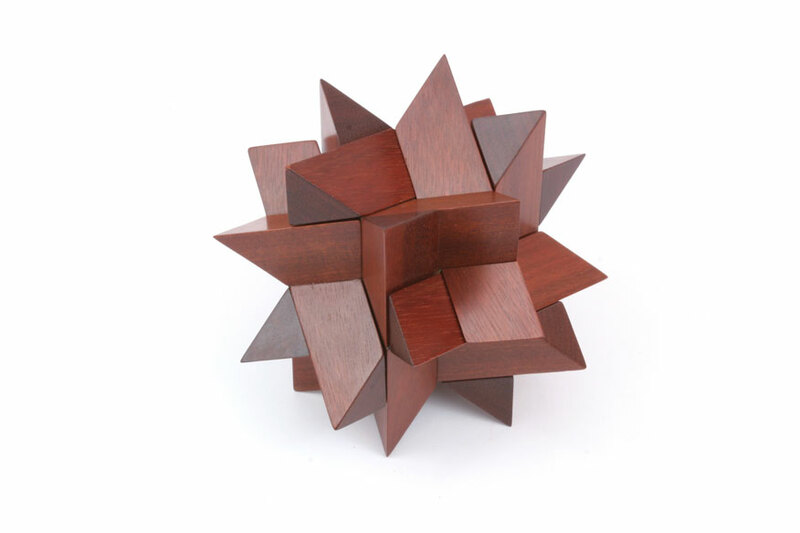 Notes: Six different pieces form the third stellation of the rhombic dodecahedron. 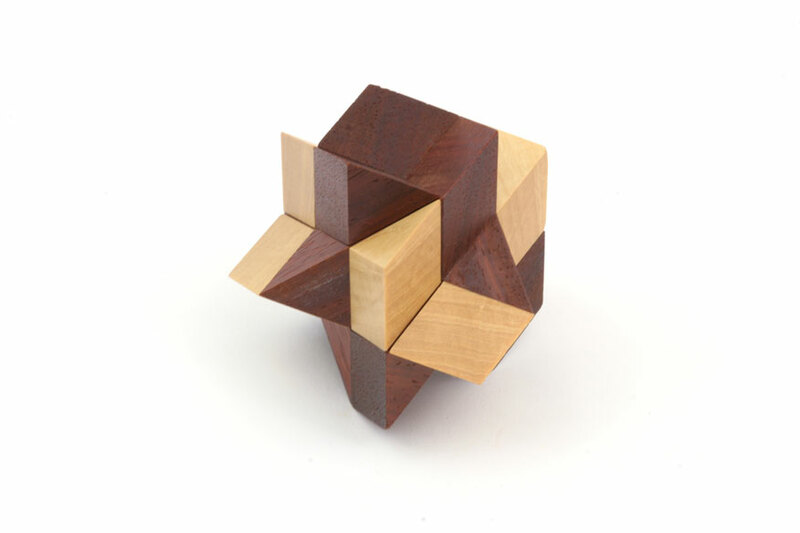 Pieces separate into two halves along each of the four main axes of symmetry. 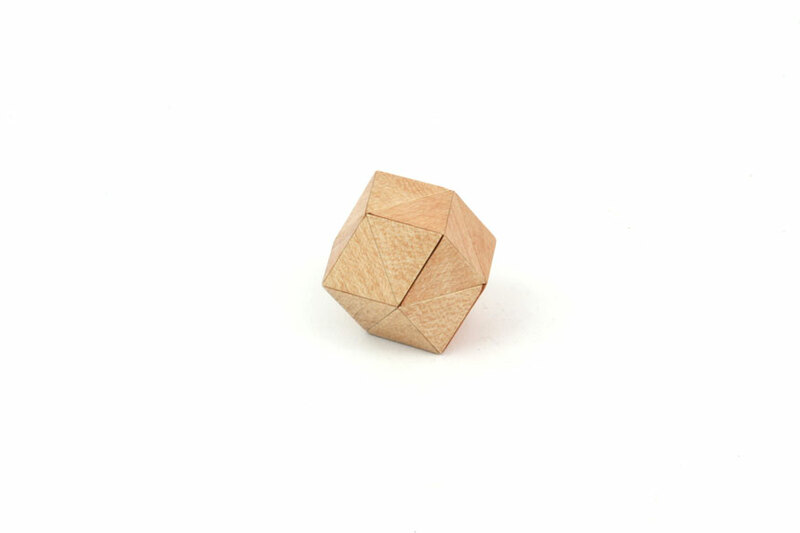 Described in The Puzzling World of Polyhedral Dissections (page 91, fig. 109), but never made by Coffin. One piece inscribed "SC.50.B, Lee, No.1". Slightly loose fit; one tip is dinged (see photo). Notes: Six identical pieces; somewhat loose fit. One piece inscribed "LEE, 1.02, SC-4, #3". Notes: Coffin design #86. 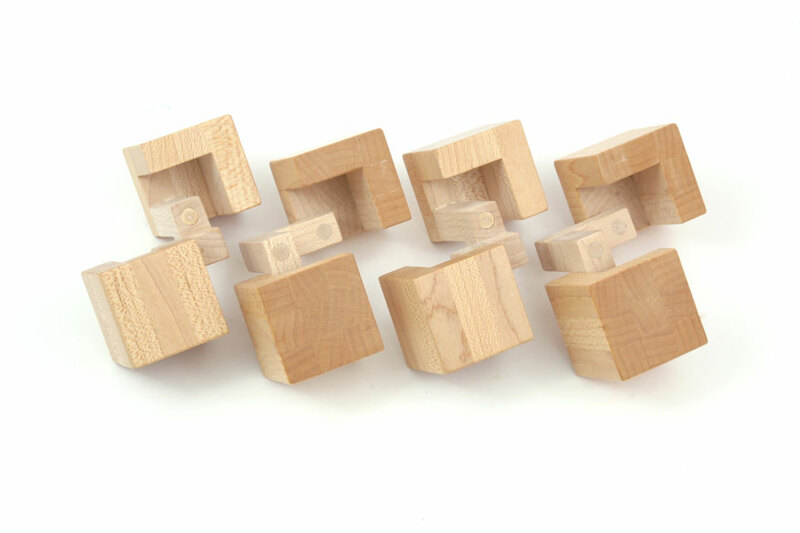 Four pieces, similar in structure to Twelve-Piece Separation. 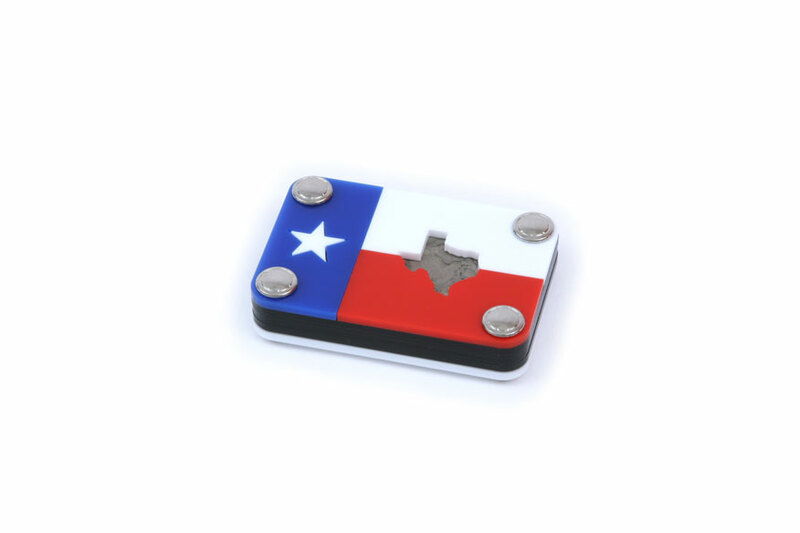 Pieces are not glued, but rather connected by steel pins with friction fitting; one connection is loose. Some edges with minor chips, and overall fit is very loose. No identifying markings. Notes: 2-piece Coffin design #51 Solid (non-hollow) construction; some wear, and seams are fairly obvious (see photo). Notes: Coffin Design #52, "zig-zag" variation. The seam between the two pieces is partially visible. Notes: Coffin design #42. 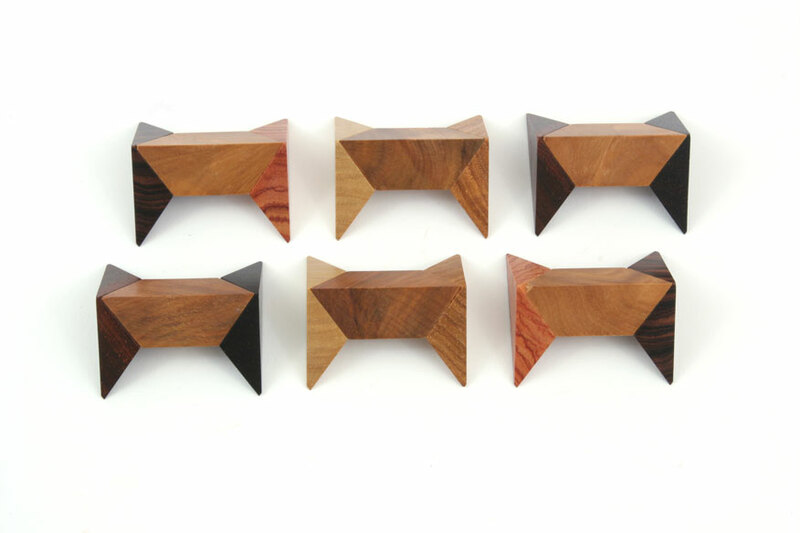 Six identical pieces, in fancy woods. Excellent fit. Most pieces have very small chips at the points and some edges. One piece with large chip from center edge (lower-right in pieces photo). 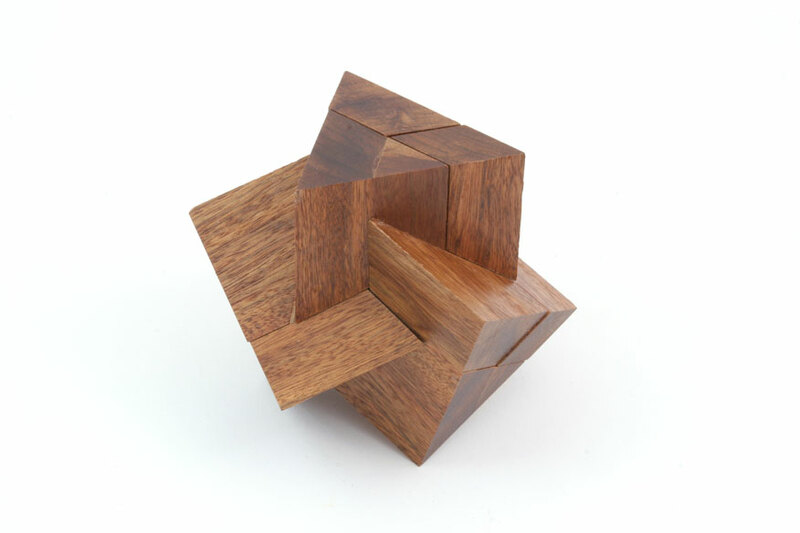 Notes: Two pair of identical pieces form a cube. Once very small surface scratch. 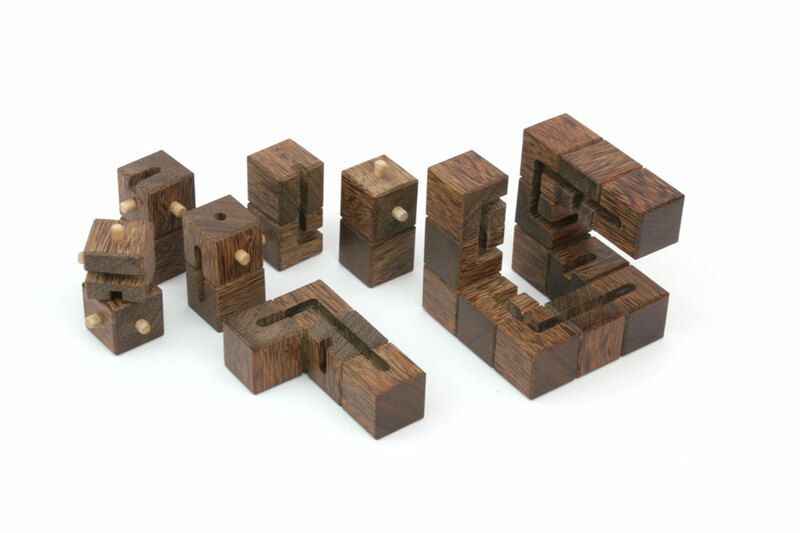 Notes: Six pieces (two with notches), inspired by traditional Japanese wood joints, assemble as a burr. Pieces made from maple and redheart. 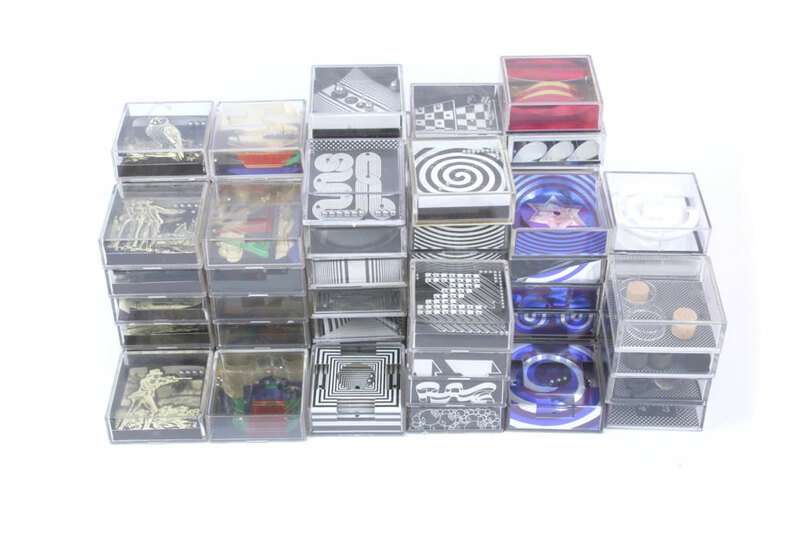 A foam version was Frans de Vreugd's IPP18 Exchange puzzle. 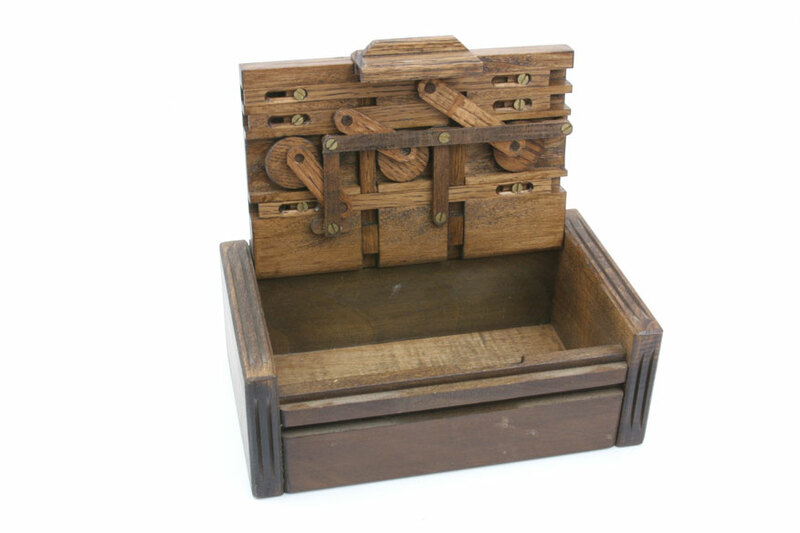 Delivered unassembled in unique storage box, designed to be geometrically equivalent to the burr pieces. A prototype by Wayne Daniel also available in this auction. 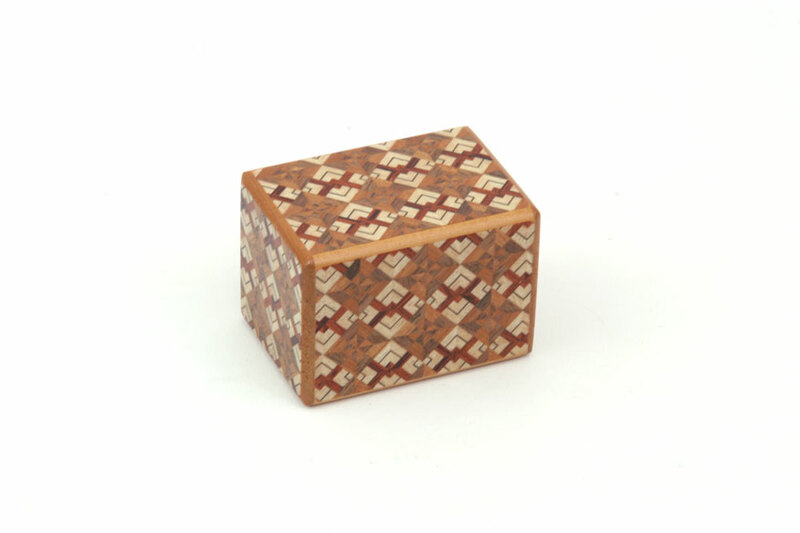 Notes: Small 18-move traditional trick box, attributed to Okiyama (but no provenance or confirming markings). Excellent condition. 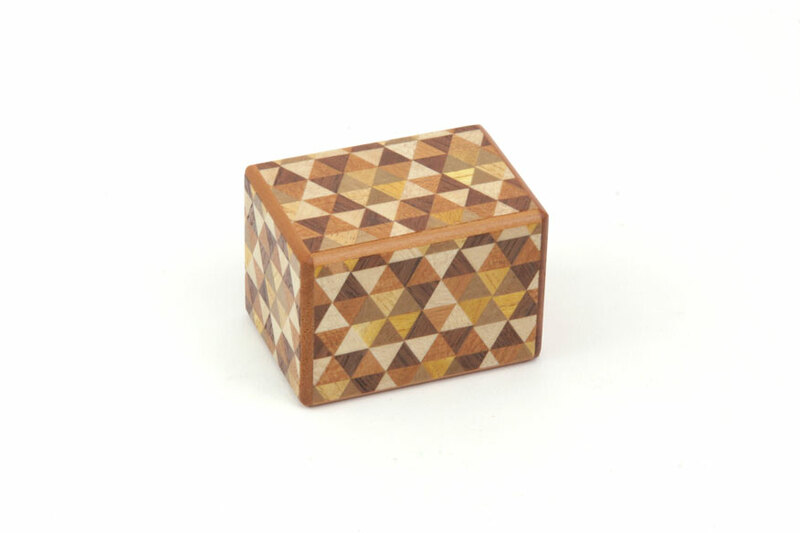 Notes: Small 14-move traditional trick box, attributed to Okiyama (but no provenance or confirming markings). Excellent condition. 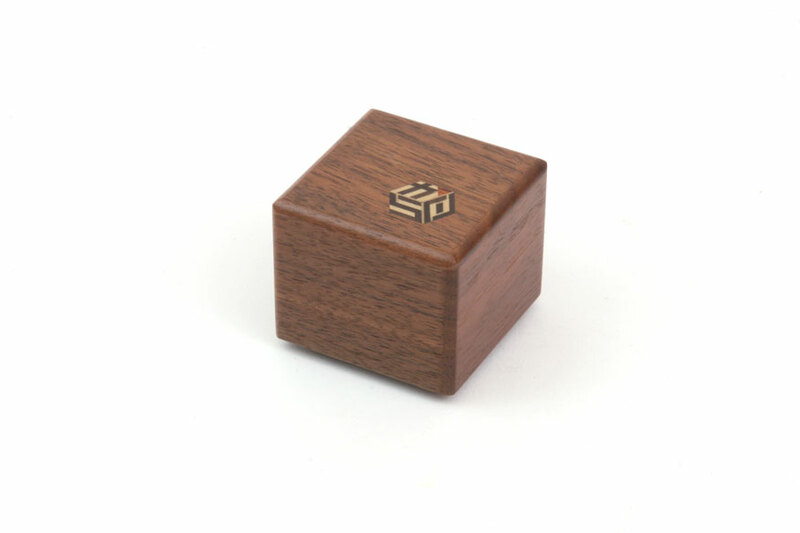 Notes: Small 14-move traditional trick box, attributed to Okiyama (but no provenance or confirming markings). Excellent condition, with slight wear. 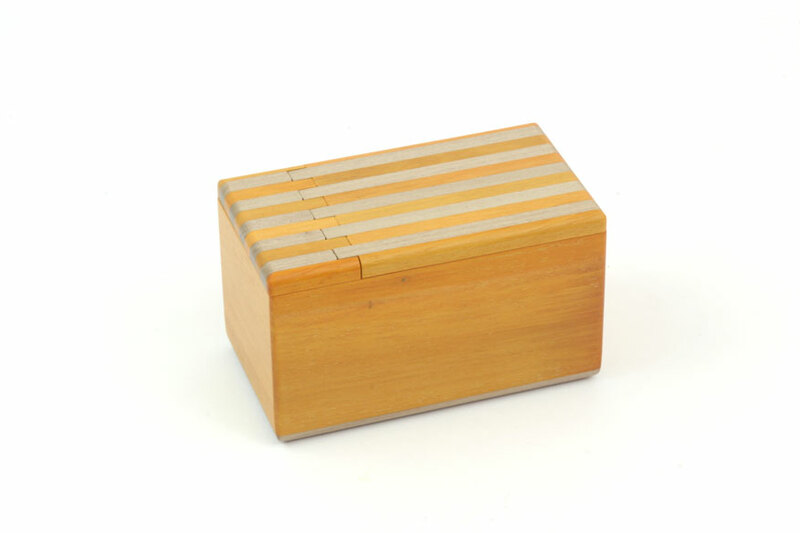 Notes: Small 3-move traditional trick box with separate compartment and drawer, attributed to Okiyama (but no provenance or confirming markings). Excellent condition. 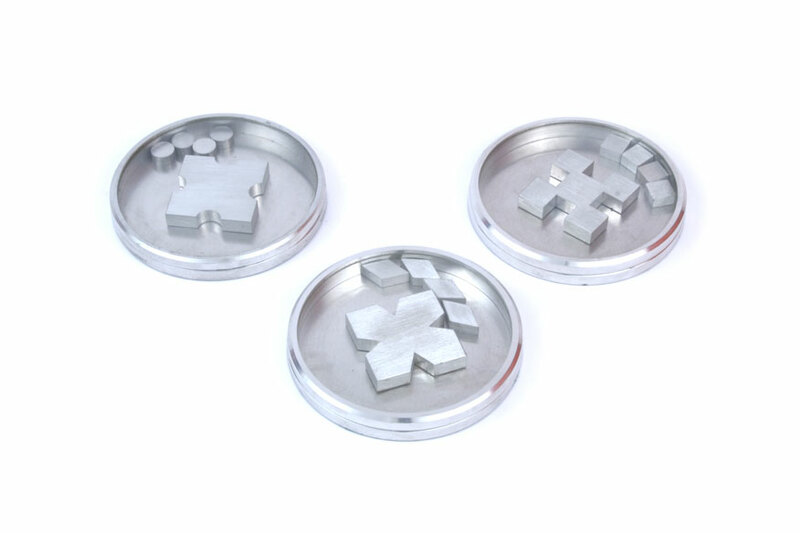 Notes: Set of three metal dexterity puzzles. 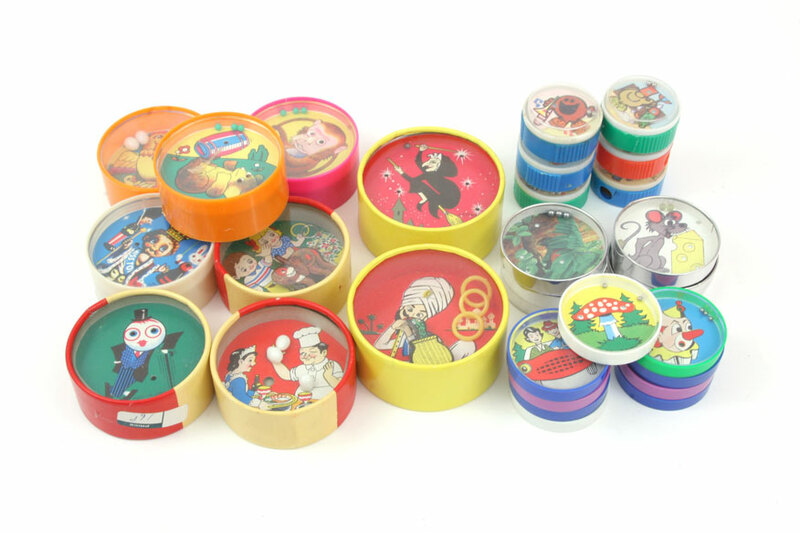 Notes: Set of 15 Aquabatic dexterity puzzles, all with original packaging, including three with Disney characters. All have little or no fluid remaining. Notes: Puzzles 1,2,5 from the Mushroom Puzzles line. 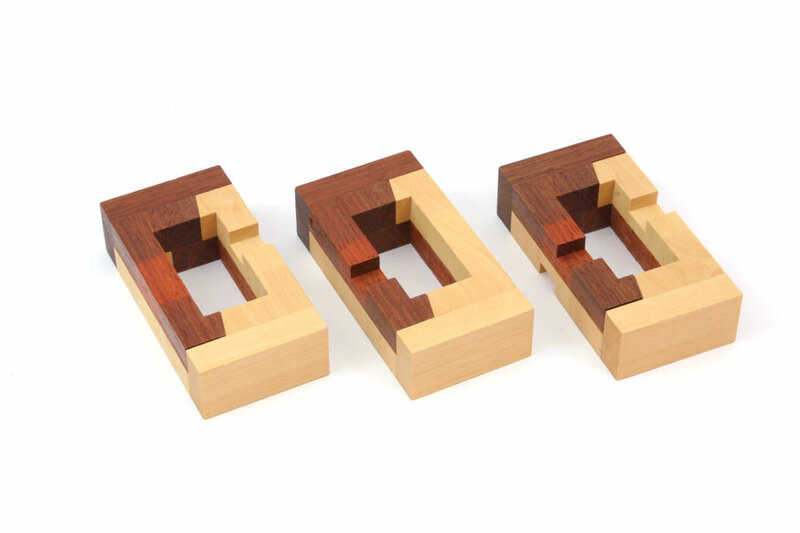 Notes: Packaged set of four dexterity puzzles designed to act as coasters. 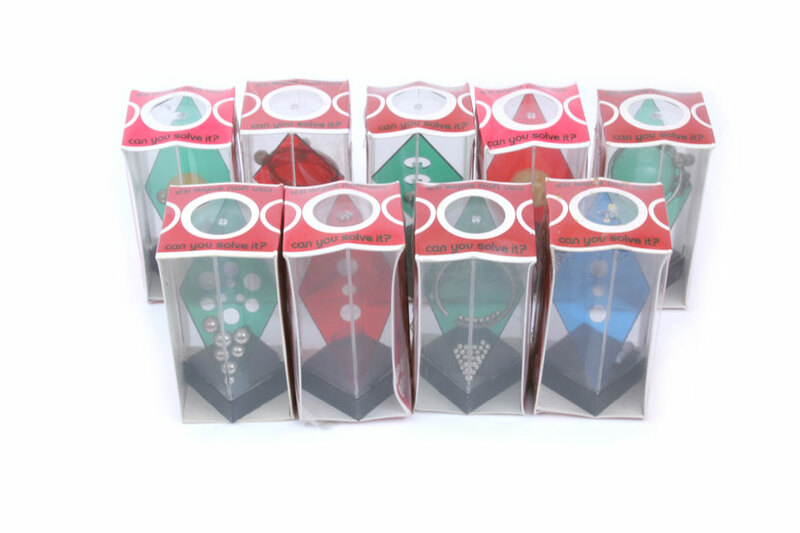 Notes: Set of 4 dexterity puzzles, including original packaging. 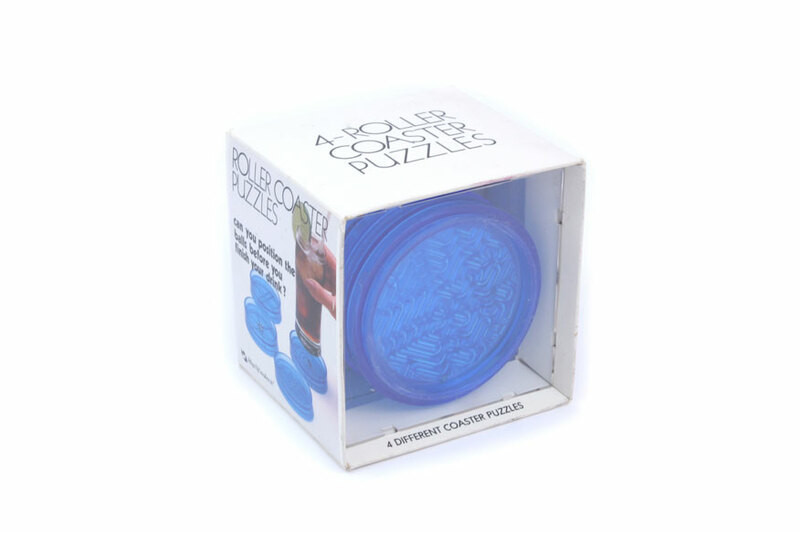 The play area for each puzzle is a refillable water reservoir. 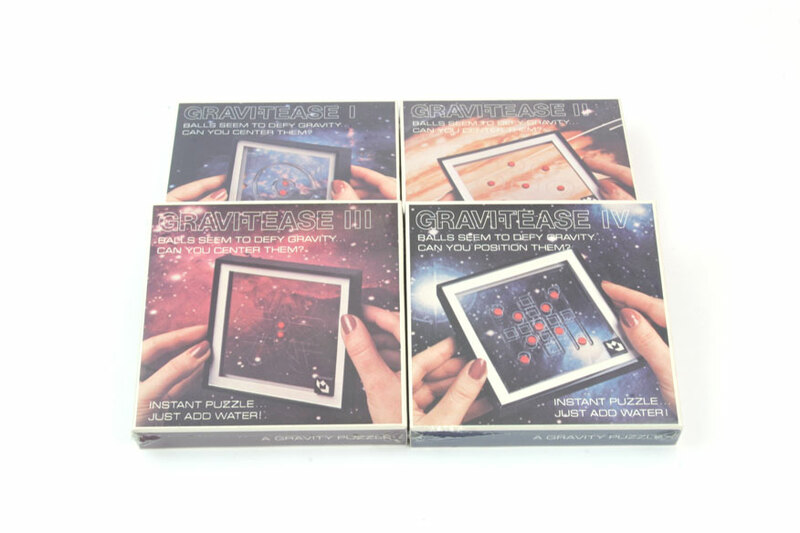 Notes: Set of three large dexterity puzzles, in original packaging. 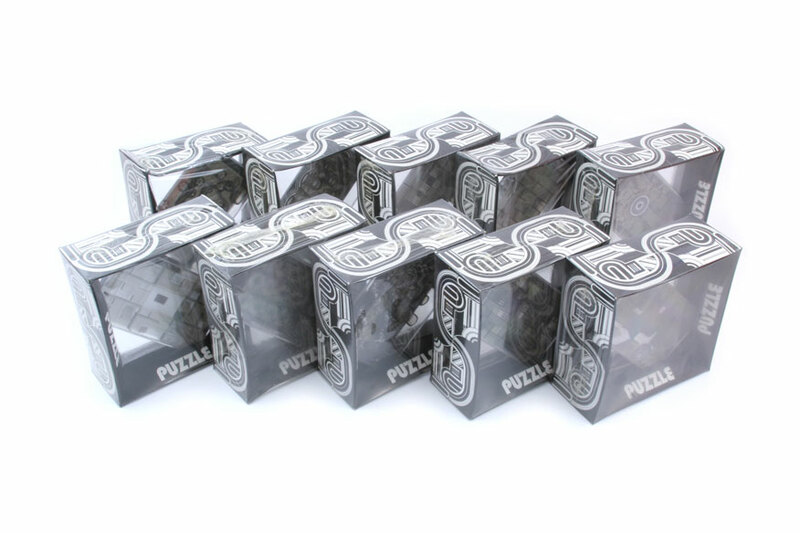 Notes: Set of 10 puzzles, in original packaging. 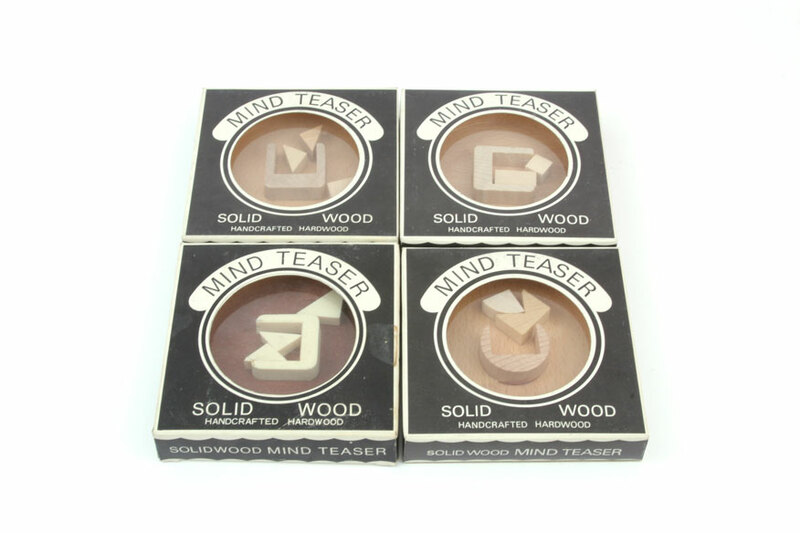 Notes: Set of dexterity puzzles, with original packaging. 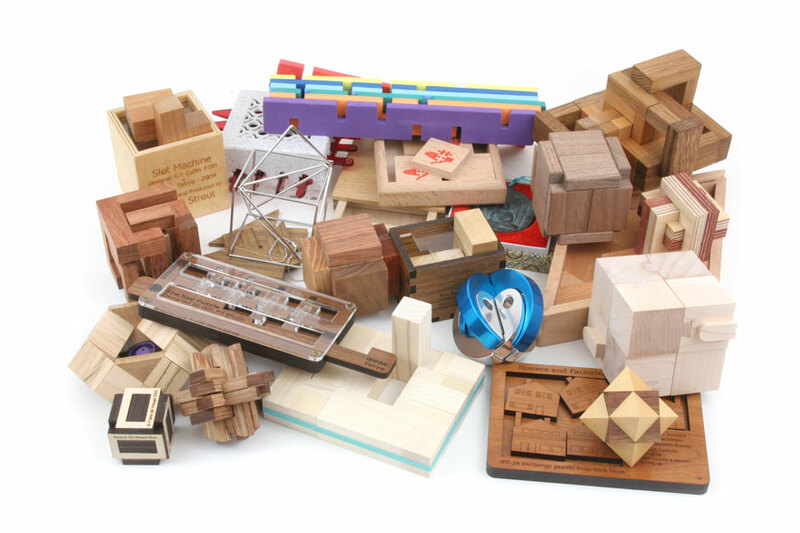 Notes: Set of 76 dexterity puzzles of various themes. 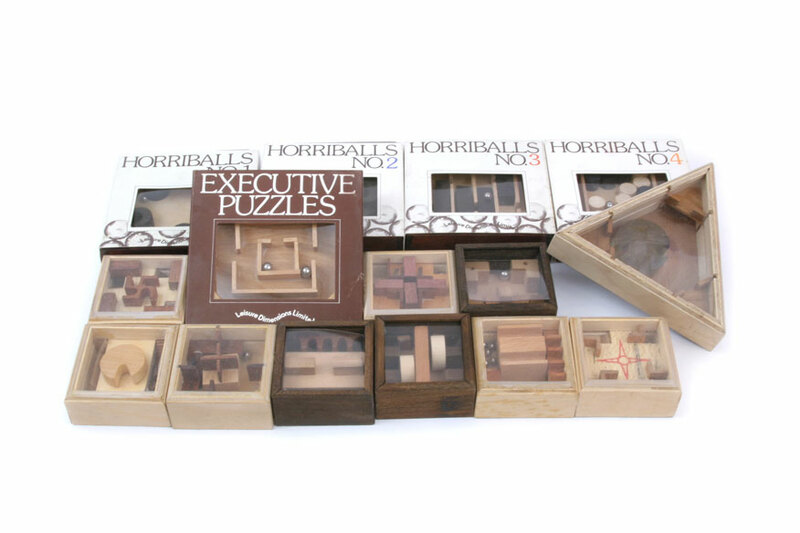 Notes: Set of 15 puzzles, including four Horriballs puzzles. Many of the plastic covers barely fit their frames, and are easily removed. Some puzzles stuck with individual price tags. 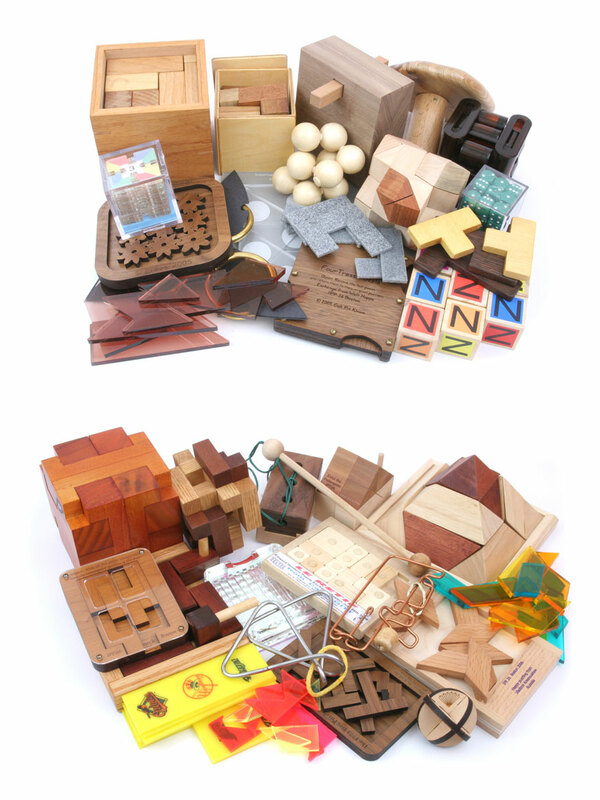 Notes: Miscellaneous set of 74 puzzles, each 4cm on edge. Notes: Boxed set of 18 dexterity puzzles, each 4cm. Condition of the puzzles is excellent, due to being stored away from sunlight, dust, etc. 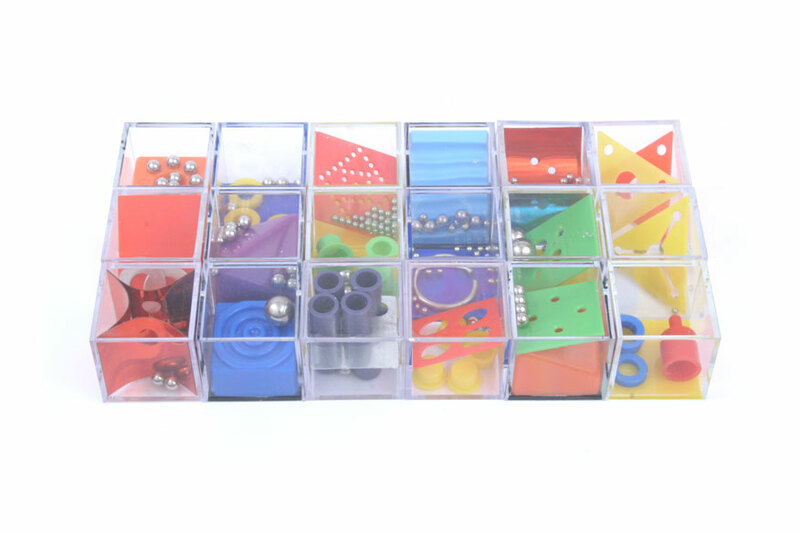 Notes: Set of 10 dexterity puzzles, including display box and inventory sheet. Some puzzles stuck with individual price tags. 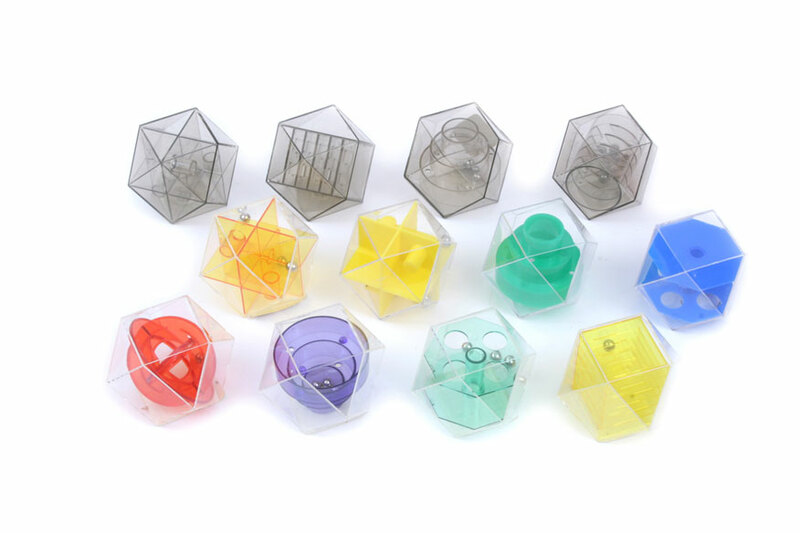 Notes: Set of 12 dexterity puzzles, all with cuboctahedral shape. Some puzzles stuck with individual price tags. Notes: Three dexterity puzzles, with goal to get all the small balls up a ramp and resting on top of the vehicle. 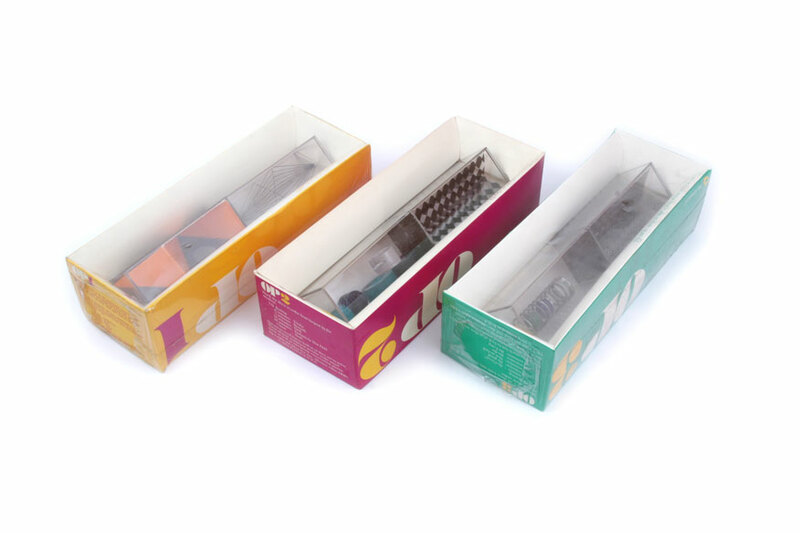 Each includes original packaging. 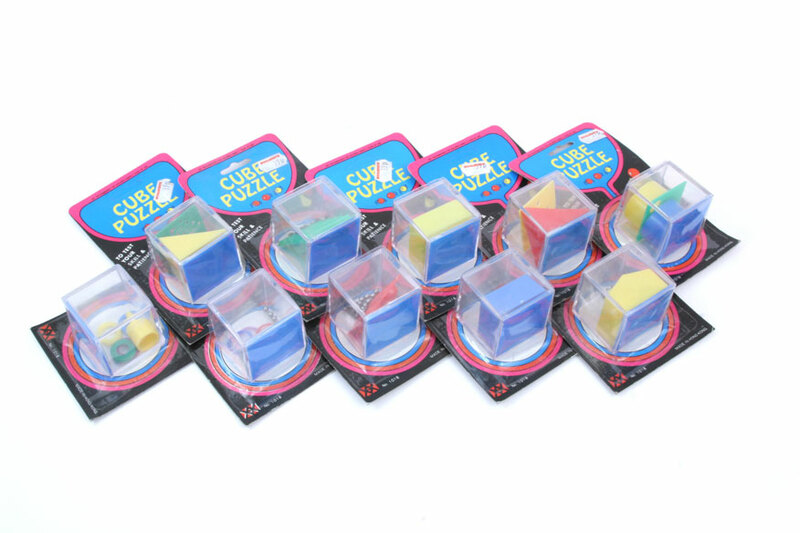 Notes: Set of 10 dexterity puzzles, each in original packaging. 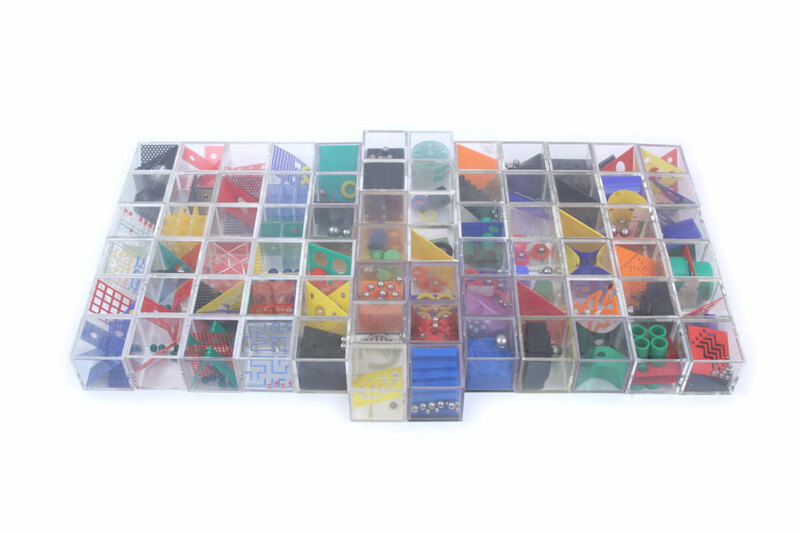 Notes: Set of 23 dexterity puzzles; some with hidden magnets, some with closing compartments, some with original packaging and hints/solutions. 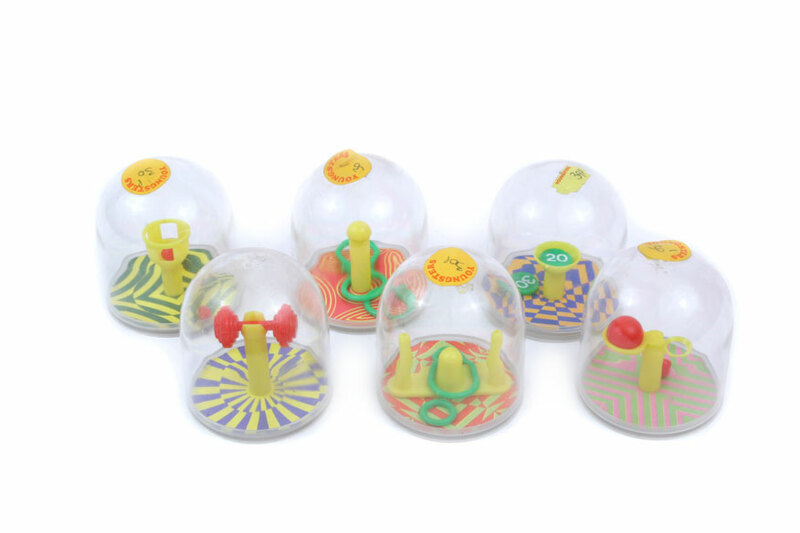 Notes: Set of 6 dexterity puzzles. 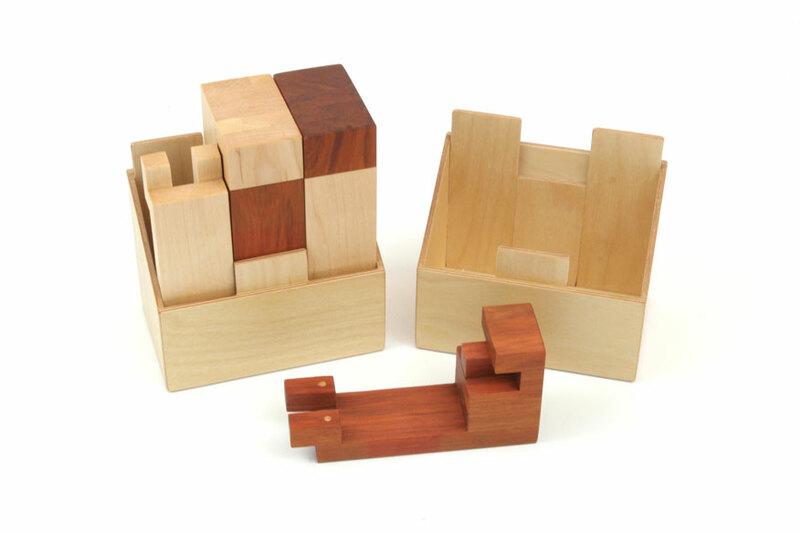 Notes: Set of 4 solid wood dexterity puzzles, all to arrange pieces into a center region. 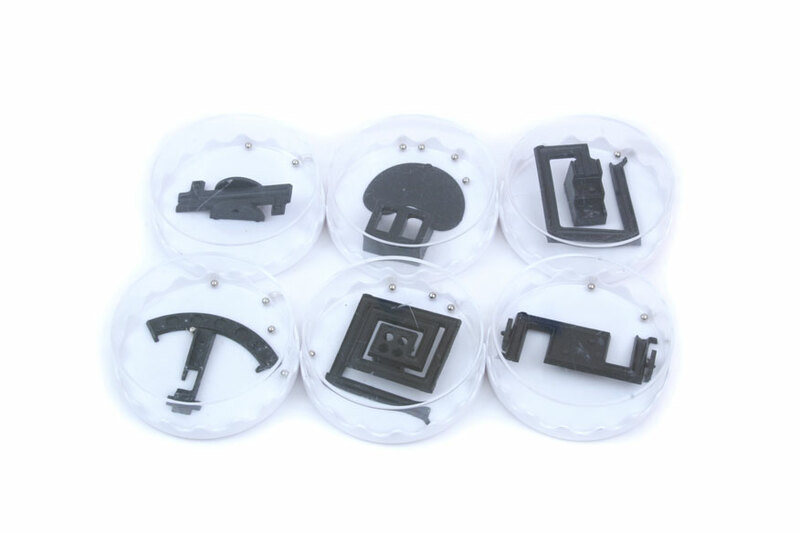 Notes: Set of 6 dexterity puzzles. All have price tags or residue.